Pardon me, I’m going to post a load of pictures without writing anything about them. 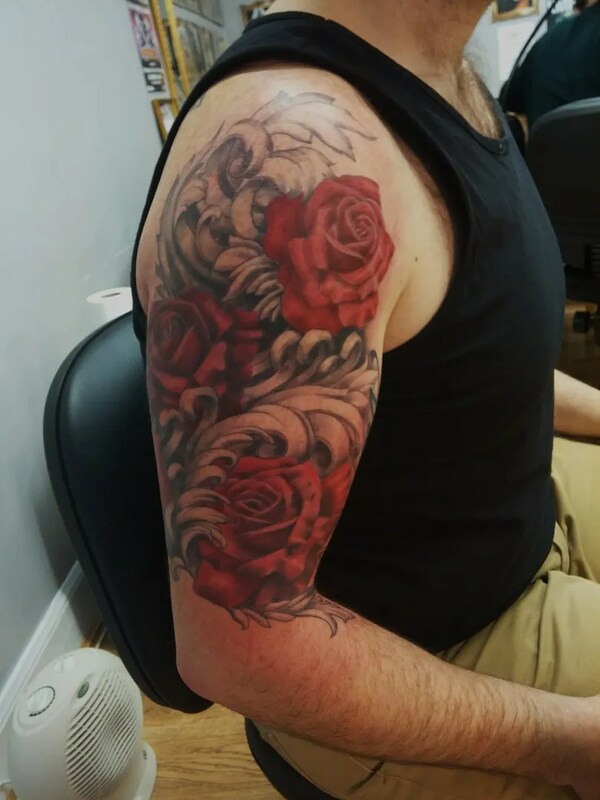 I’ve never done this before, but I’m bushed! 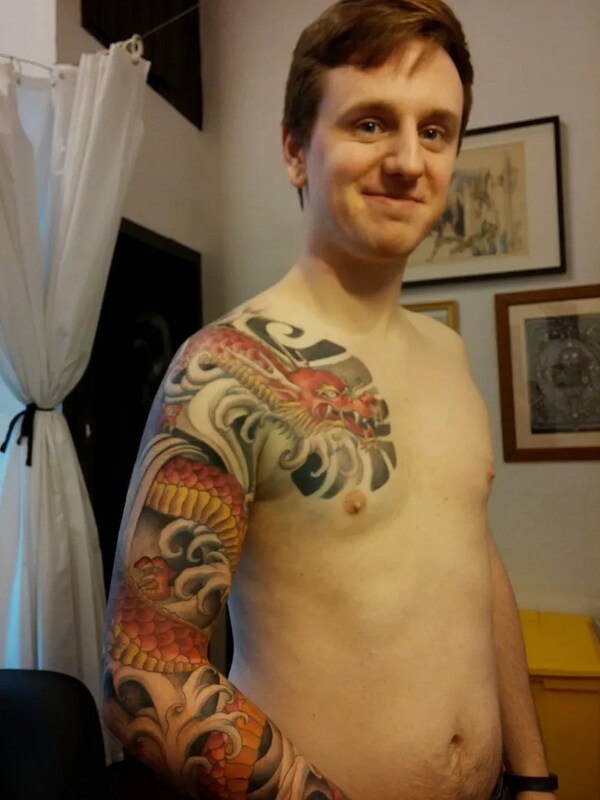 I’m going on holiday tomorrow morning, and I haven’t even thought about packing yet… it’s been a hectic few weeks. 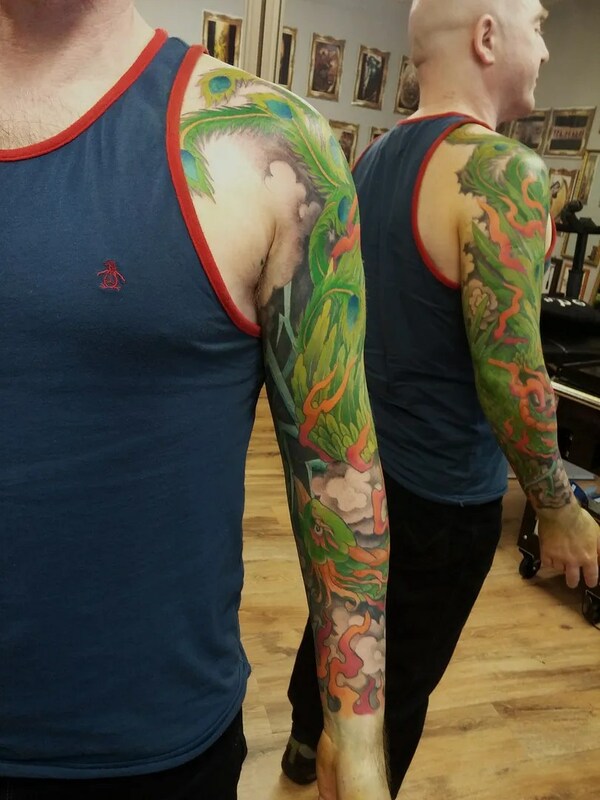 When I’m back I’ll be on top form again, I promise, and will also post pictures of the new look Tribe 2, now that it’s pretty much all done. 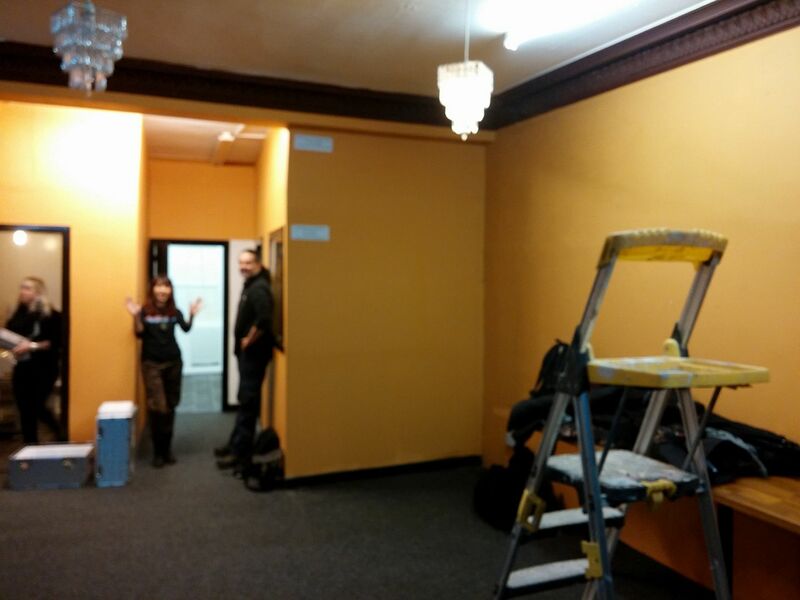 see youse in two weeks! 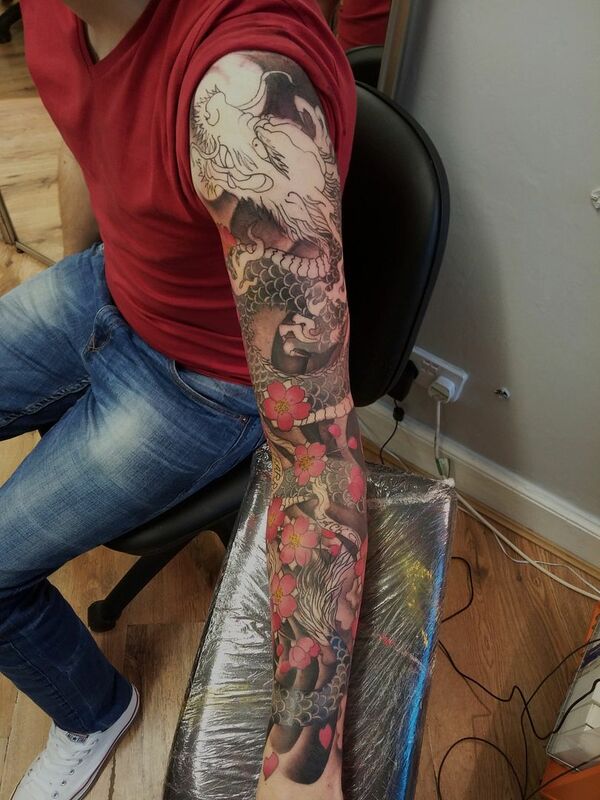 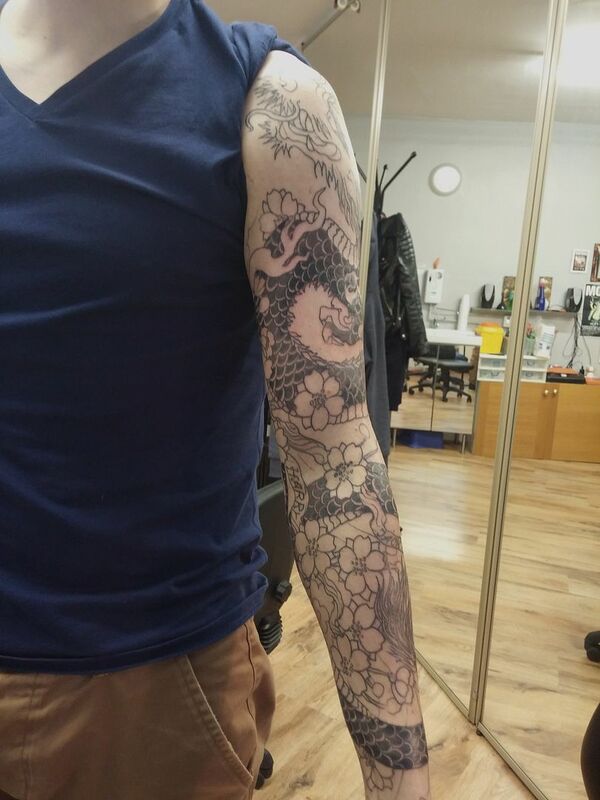 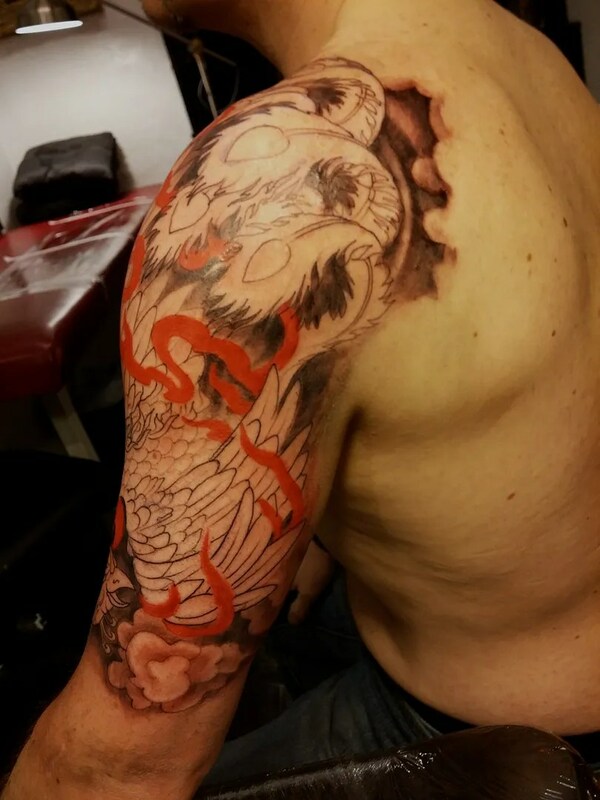 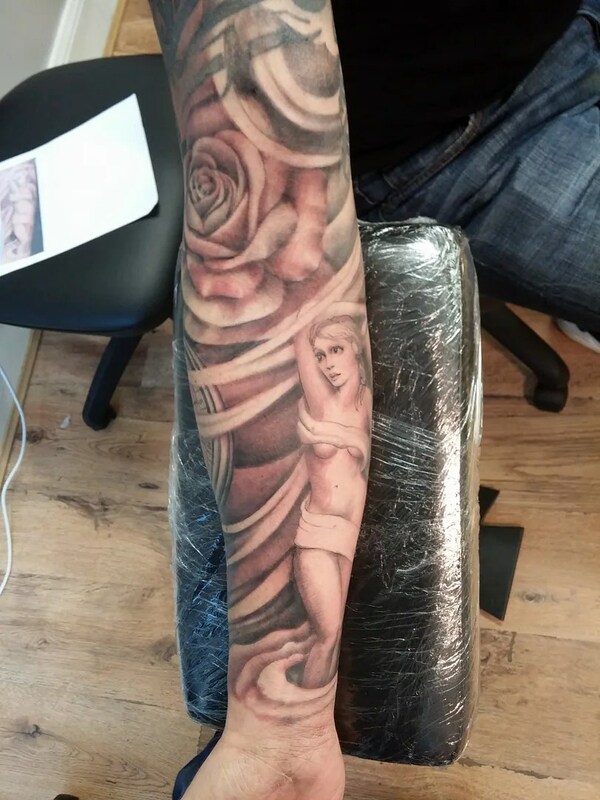 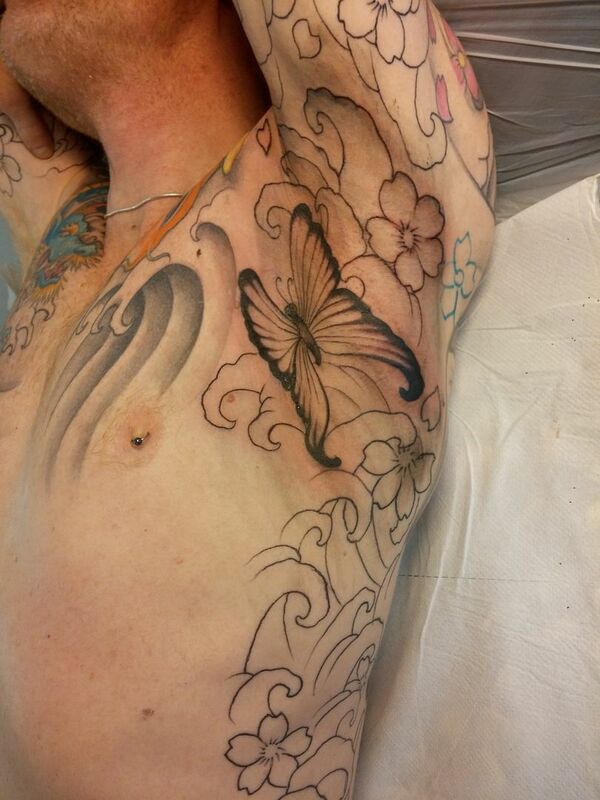 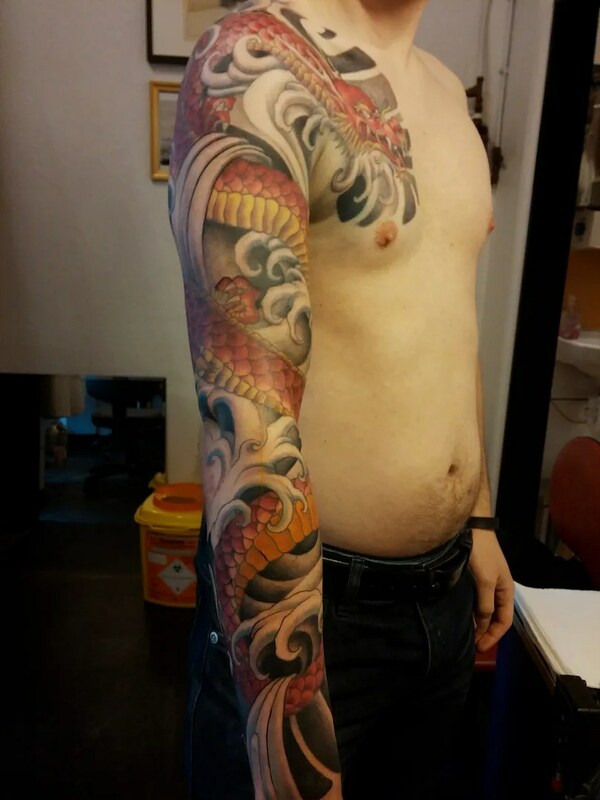 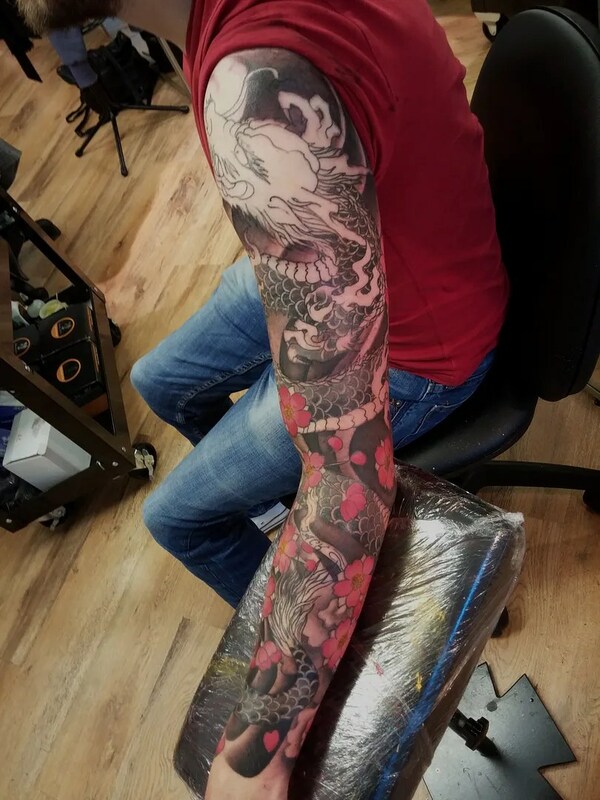 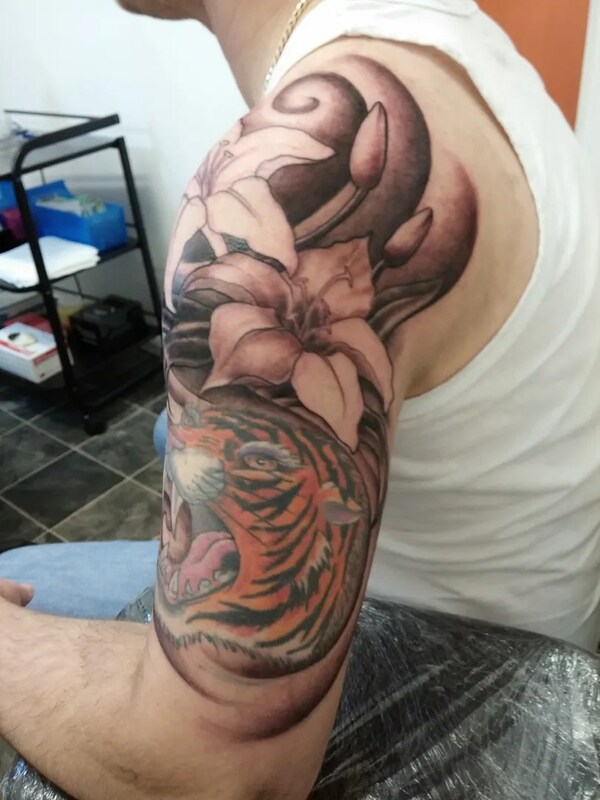 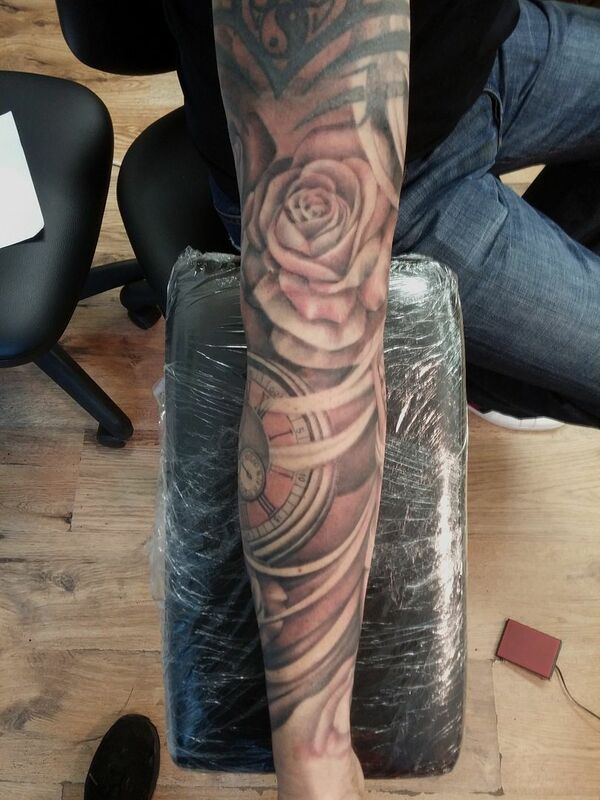 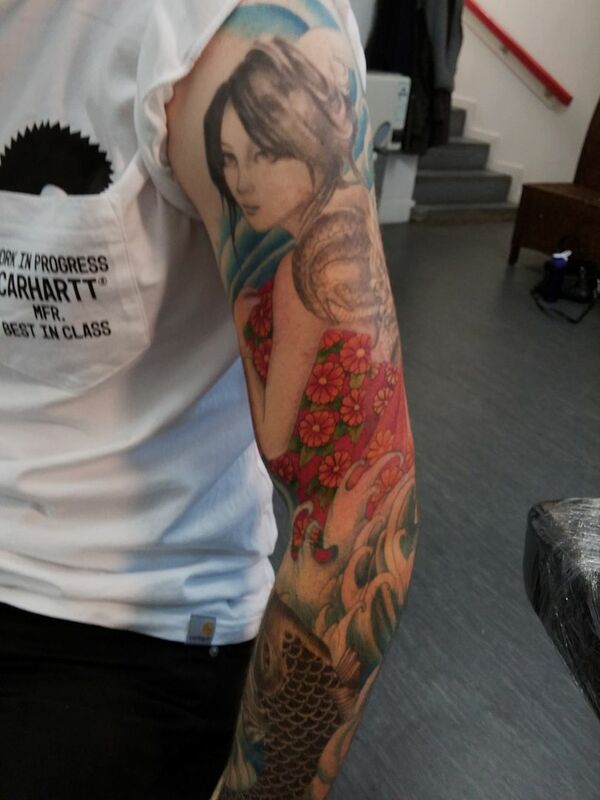 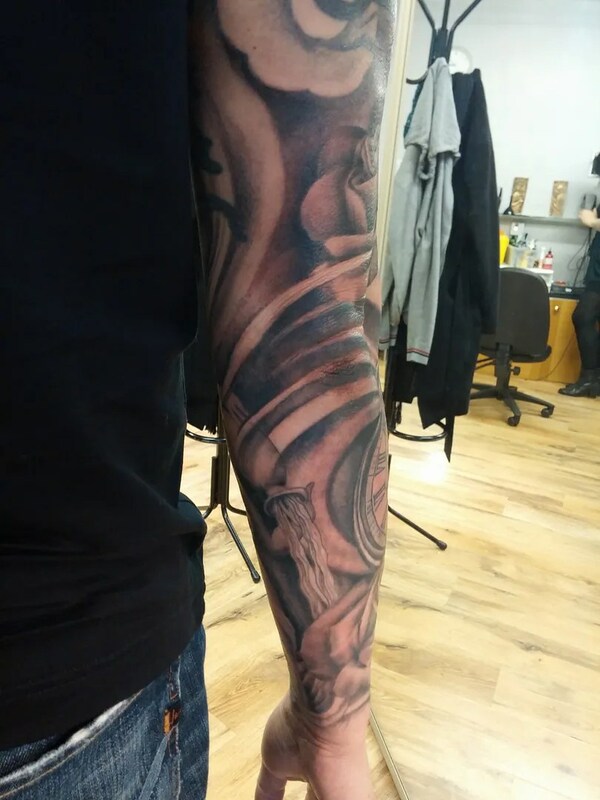 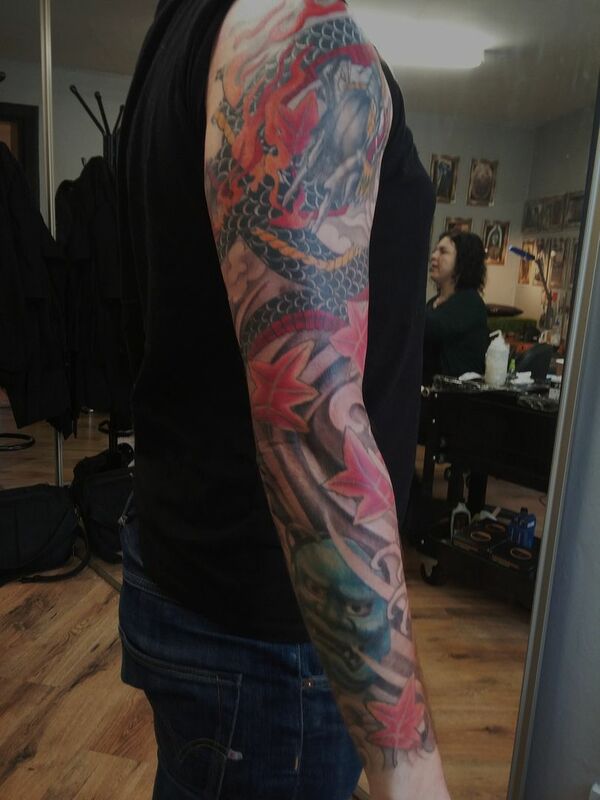 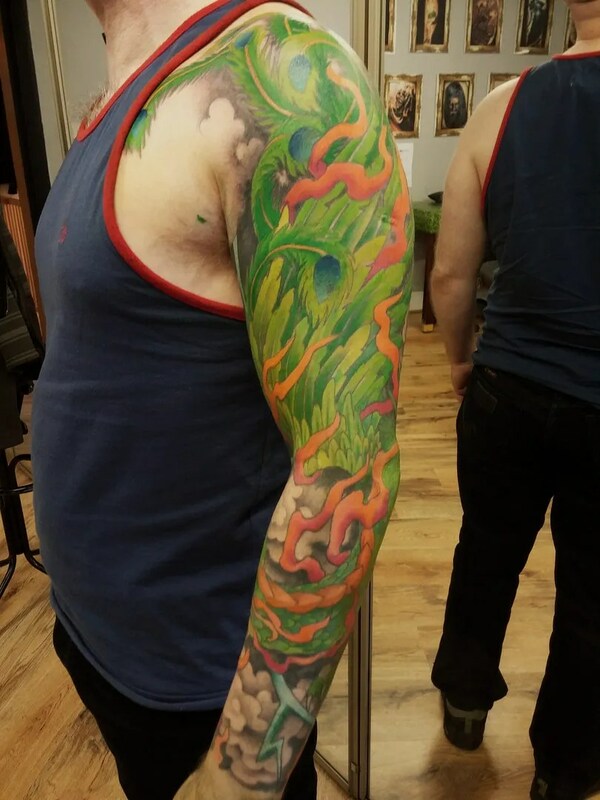 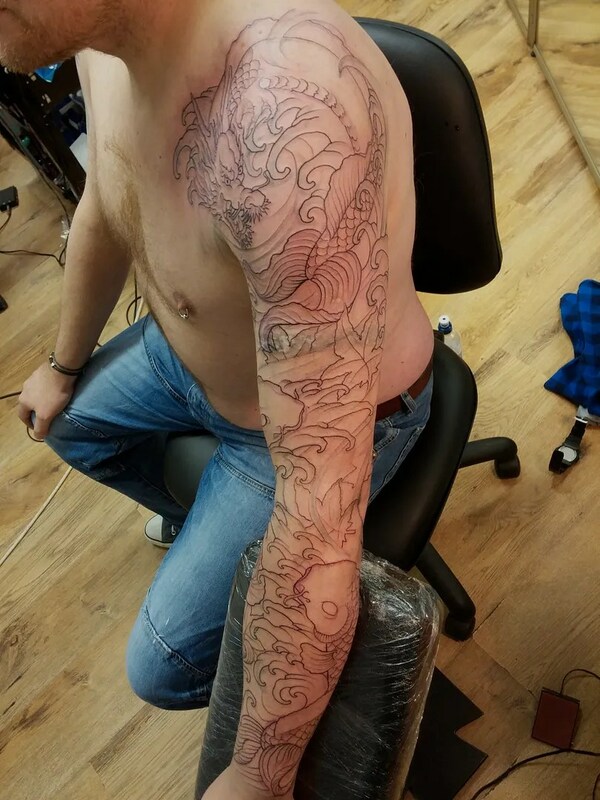 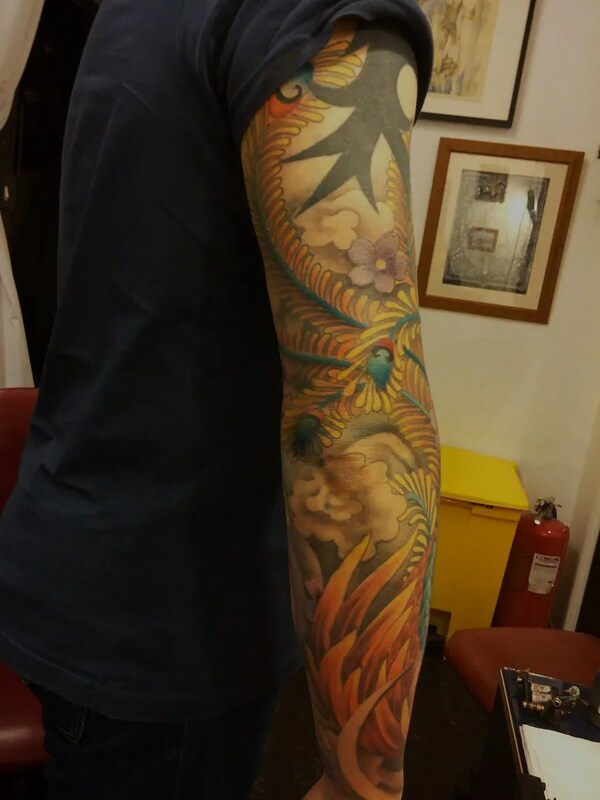 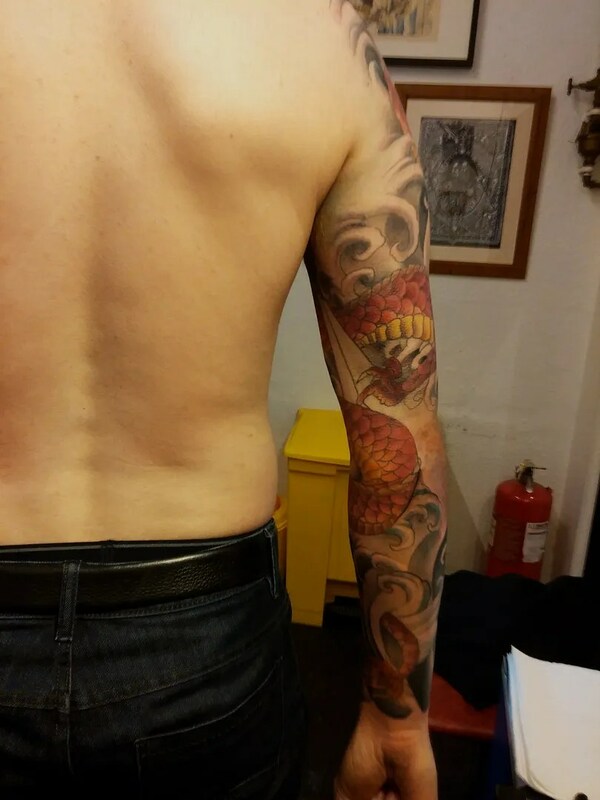 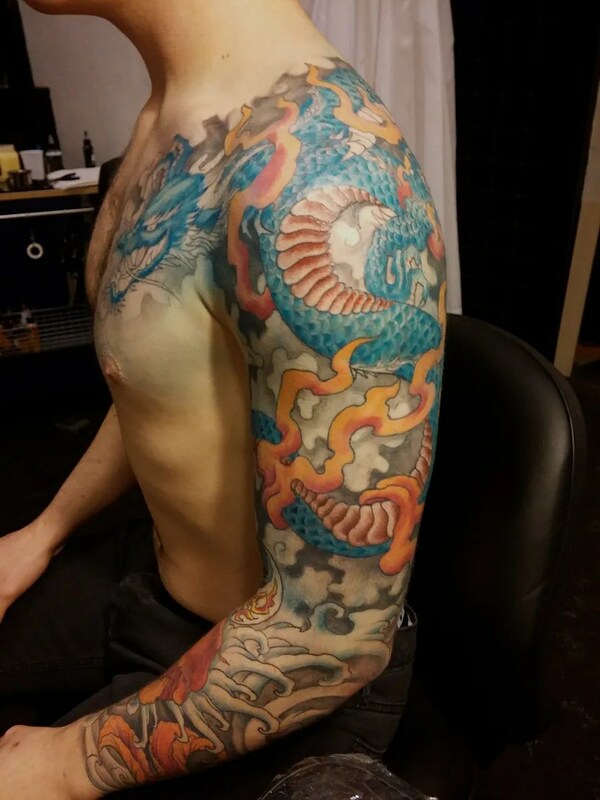 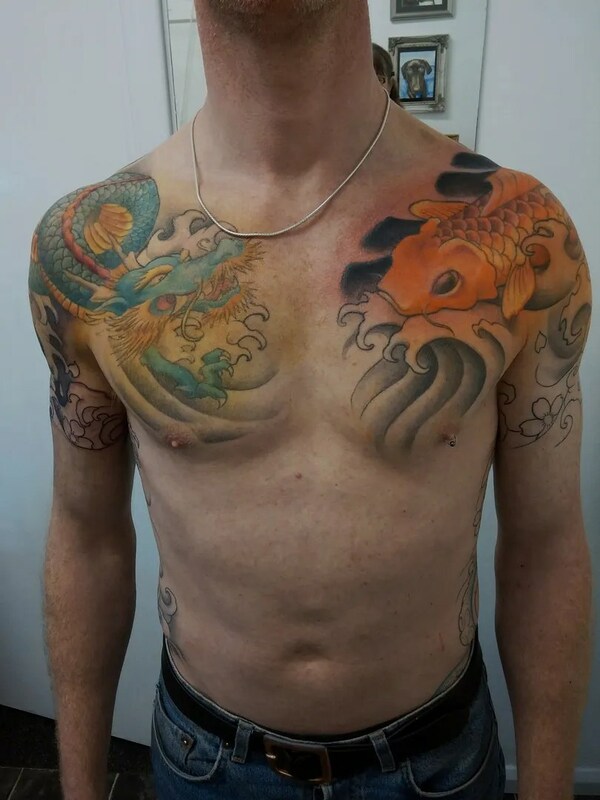 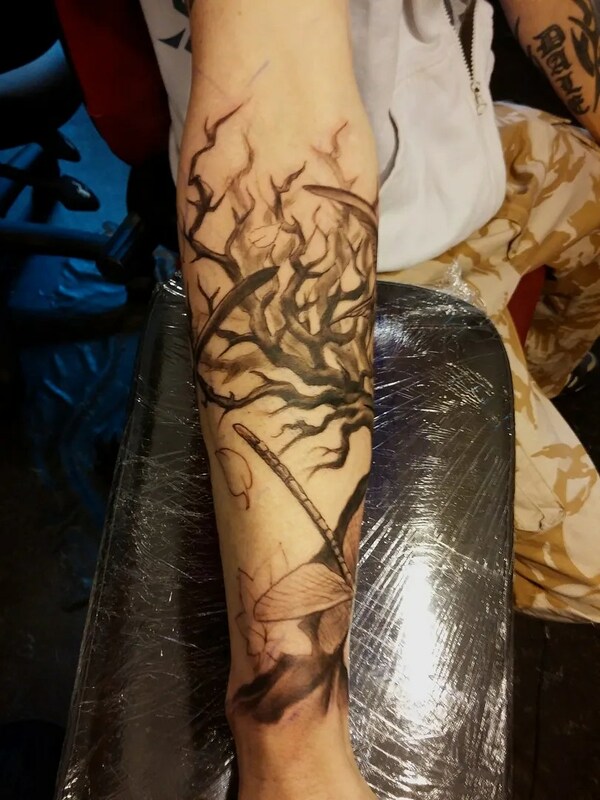 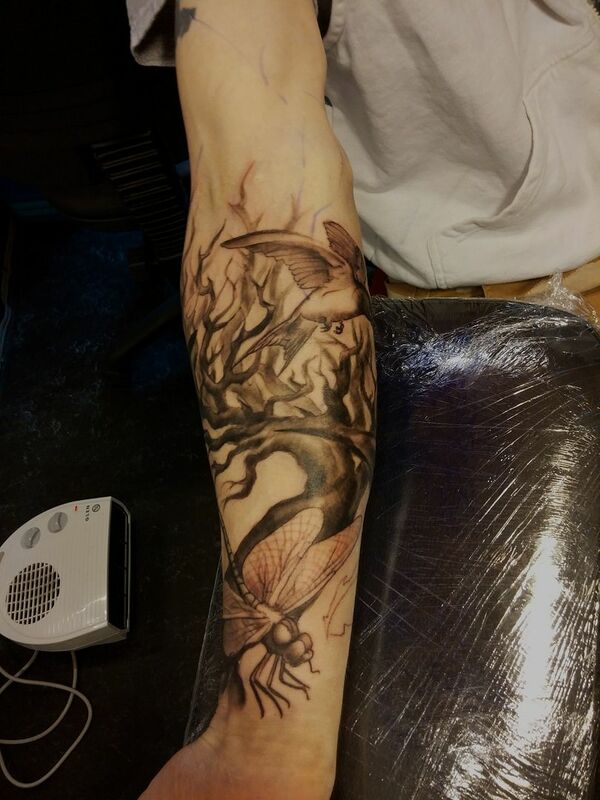 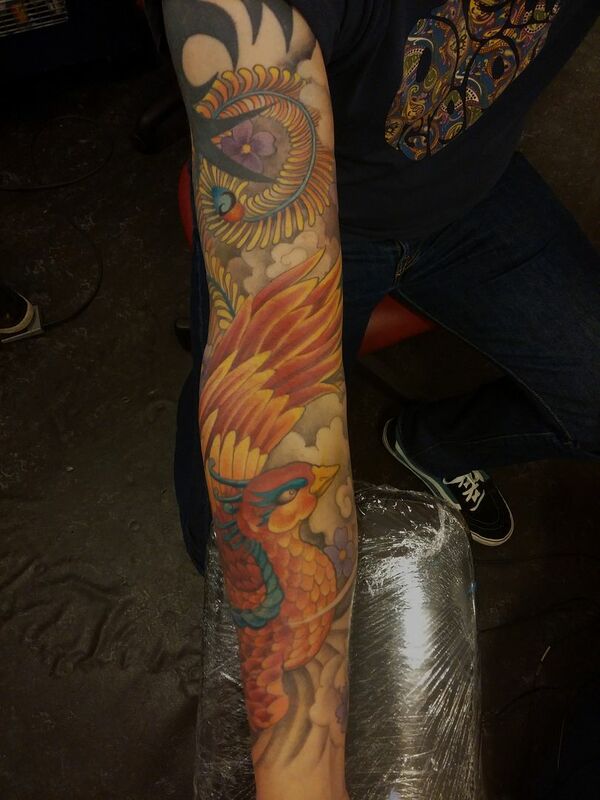 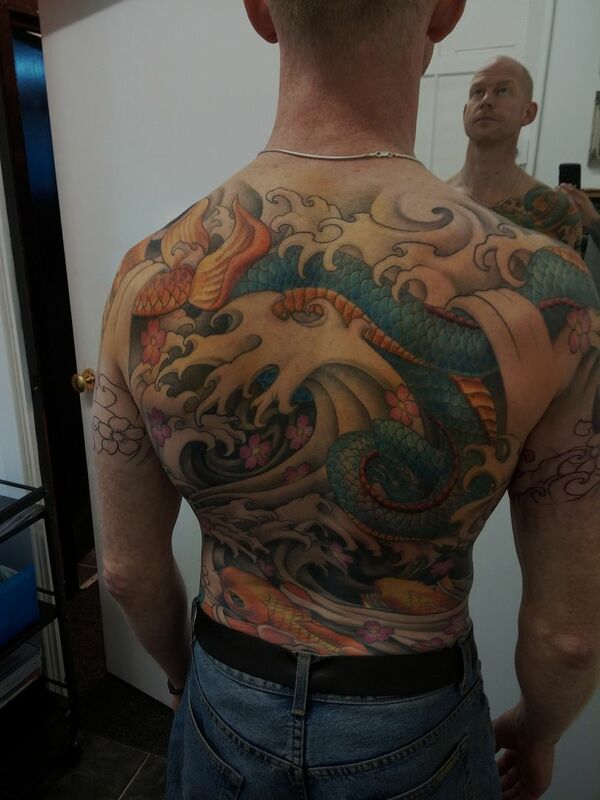 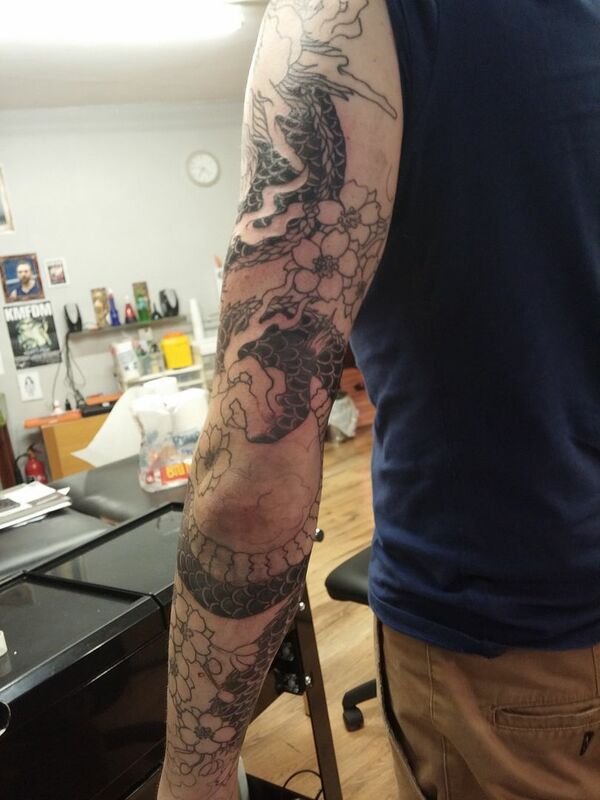 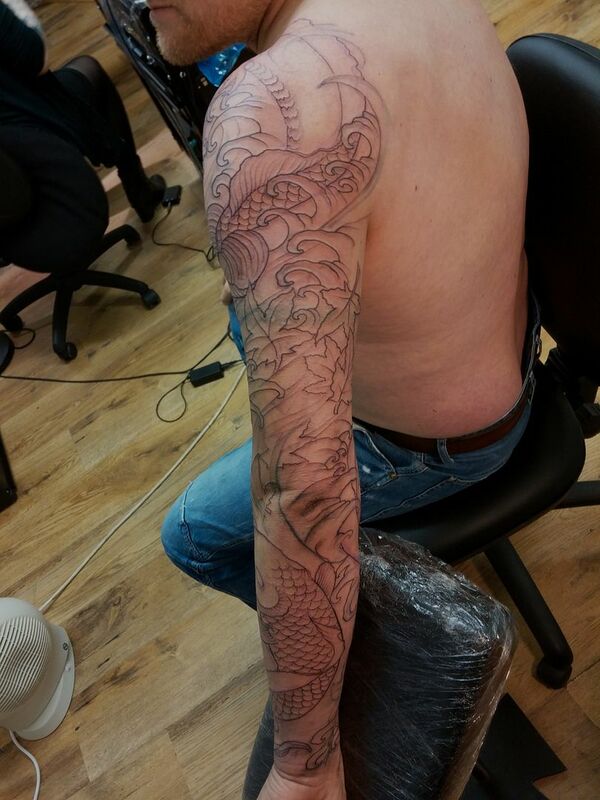 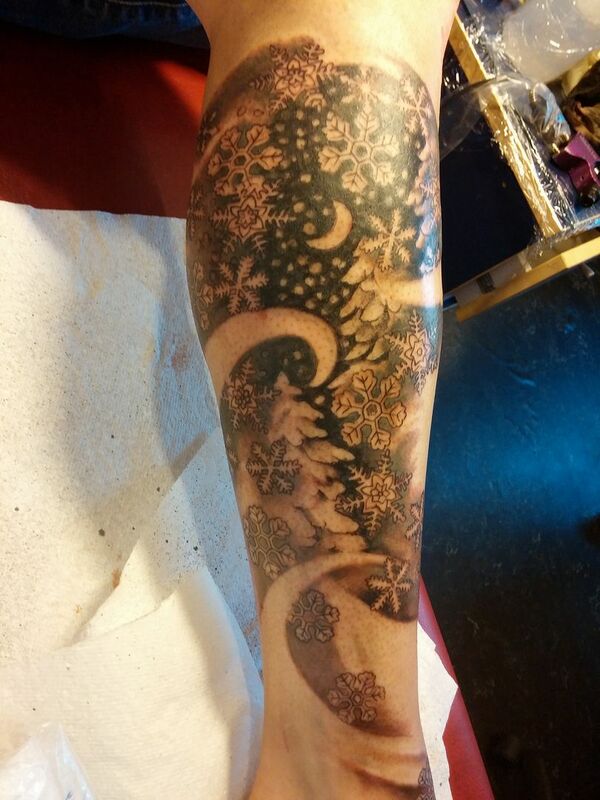 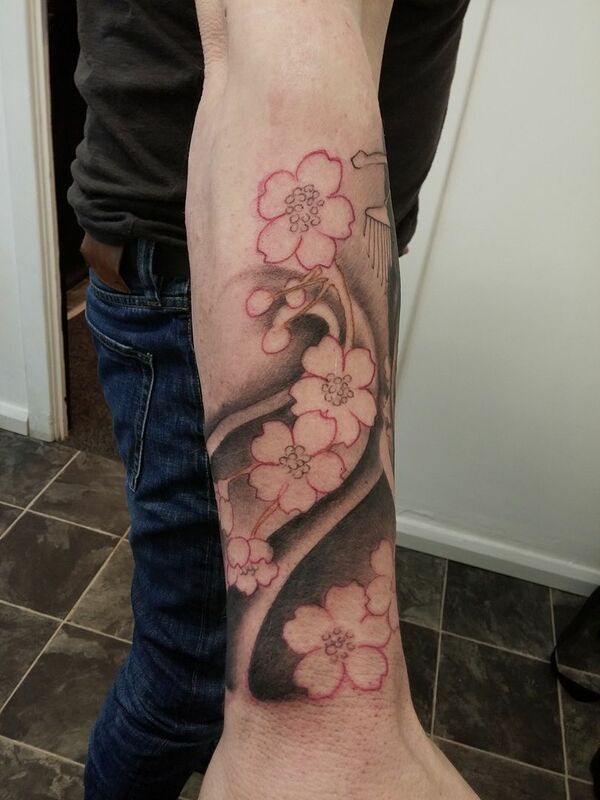 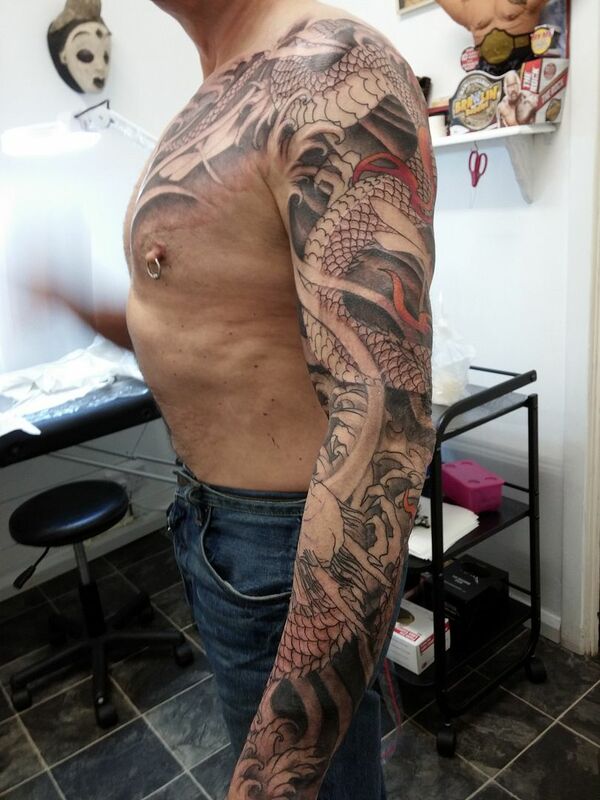 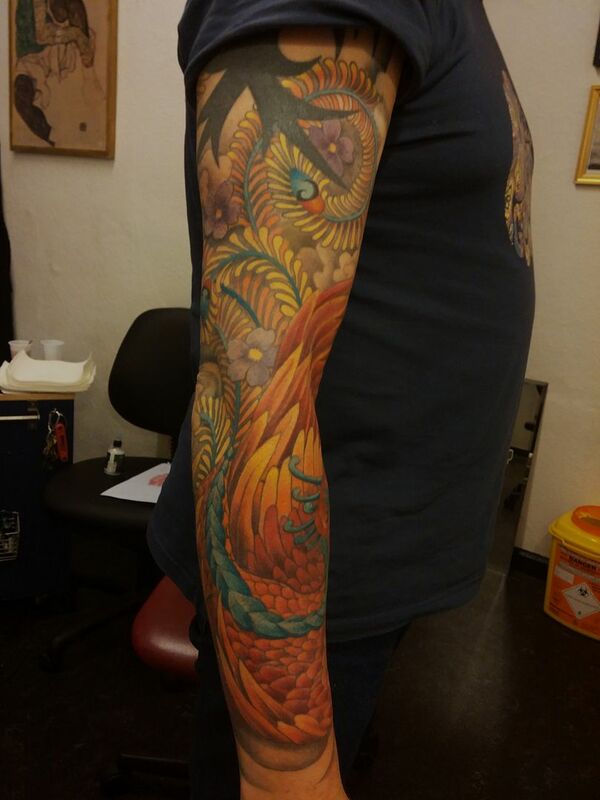 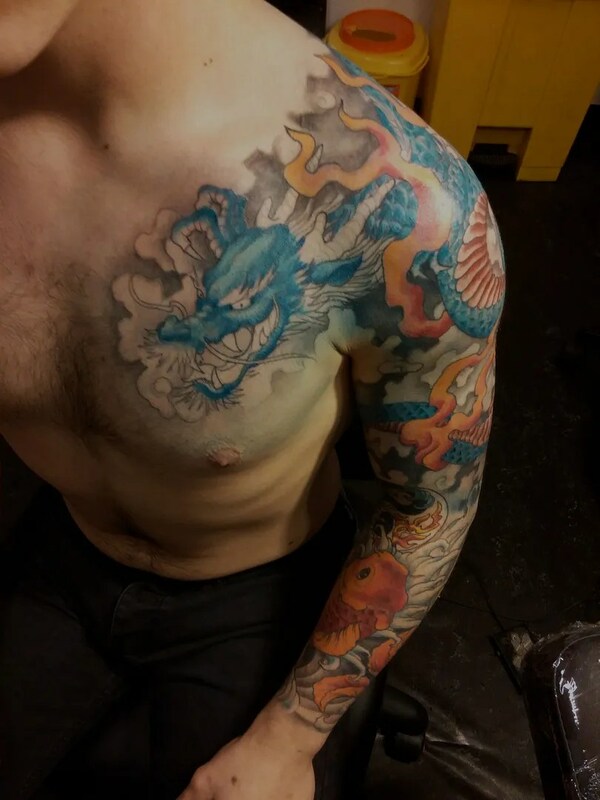 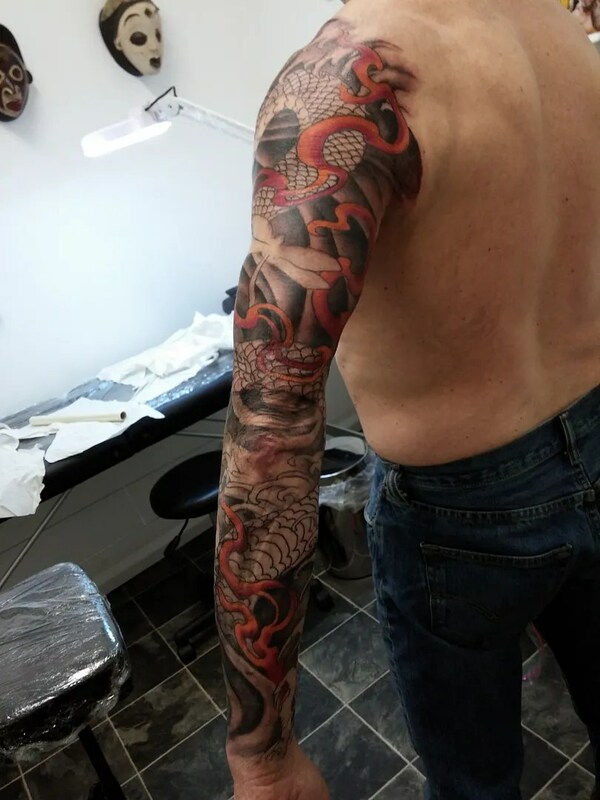 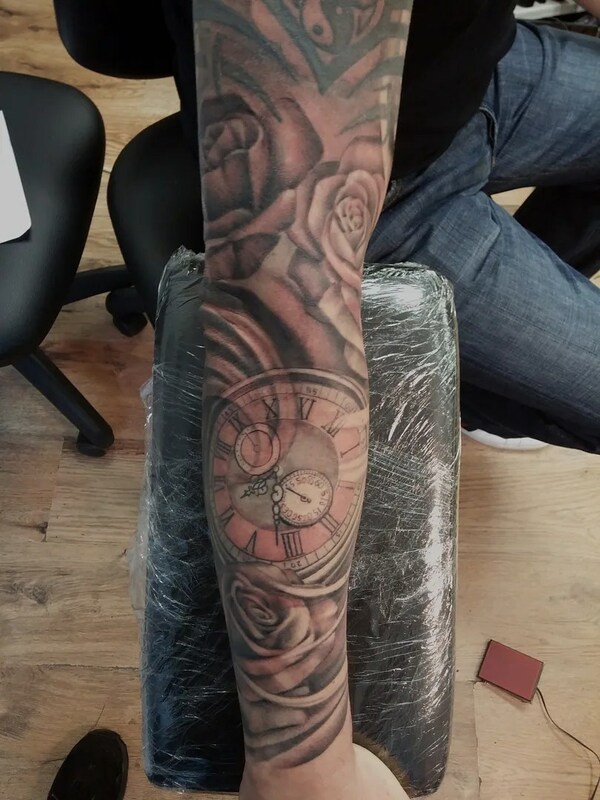 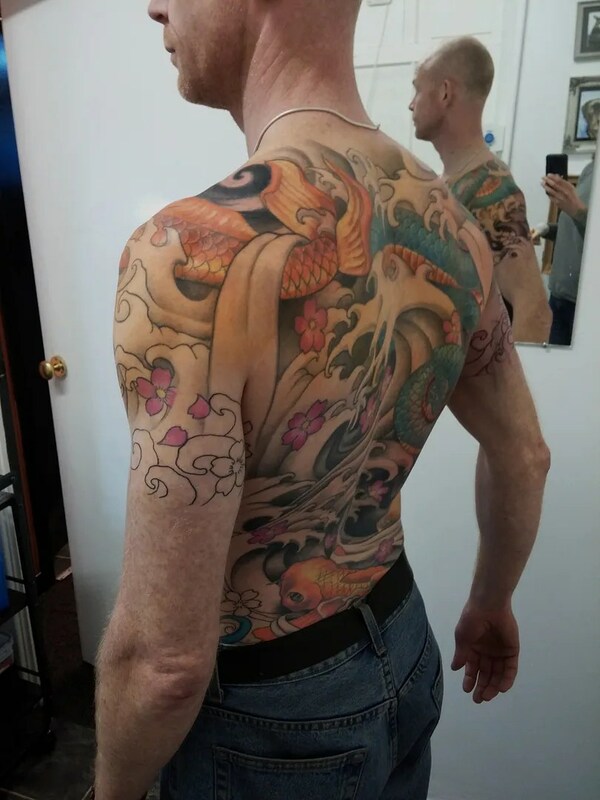 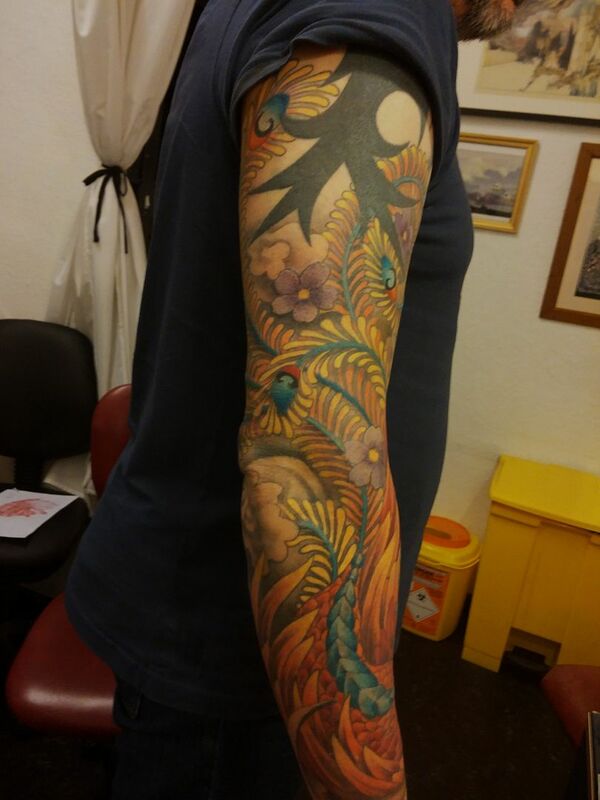 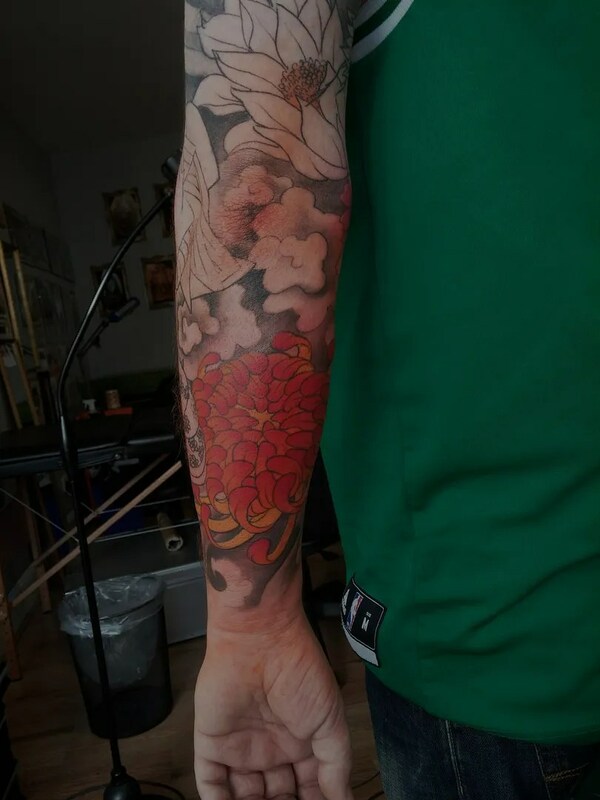 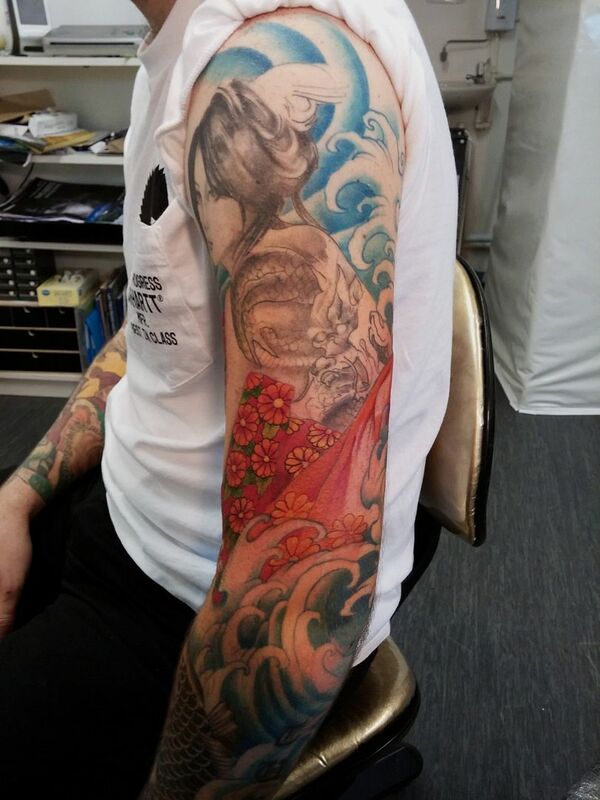 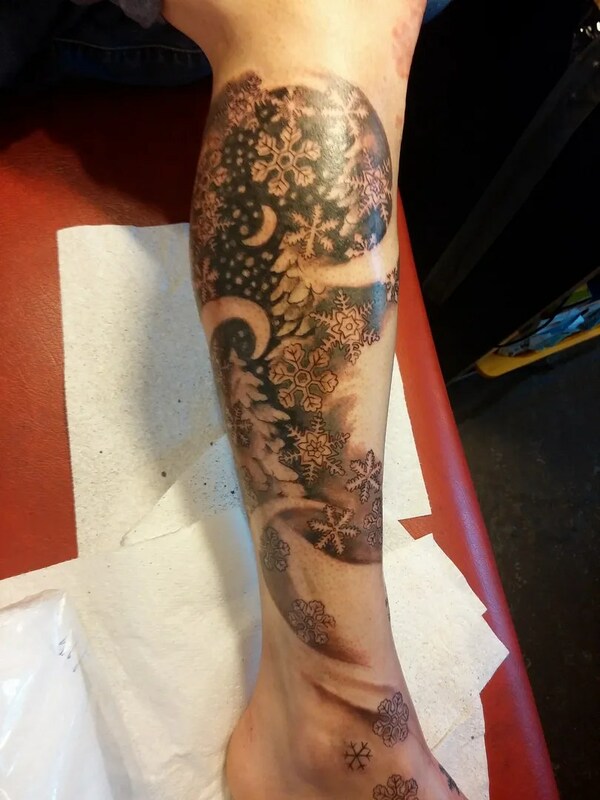 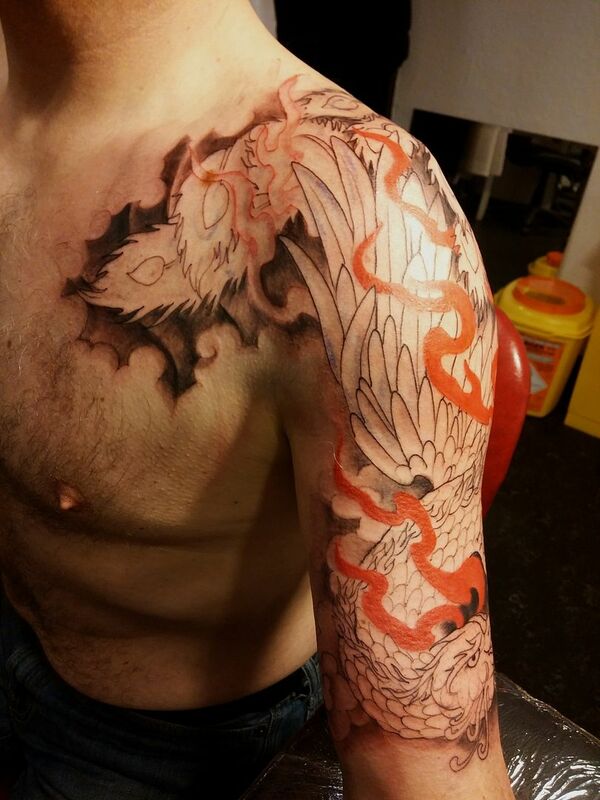 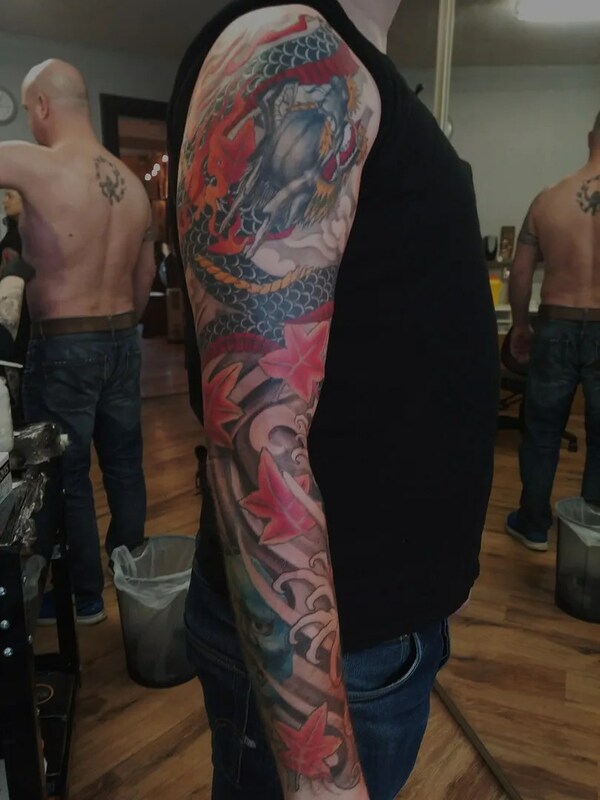 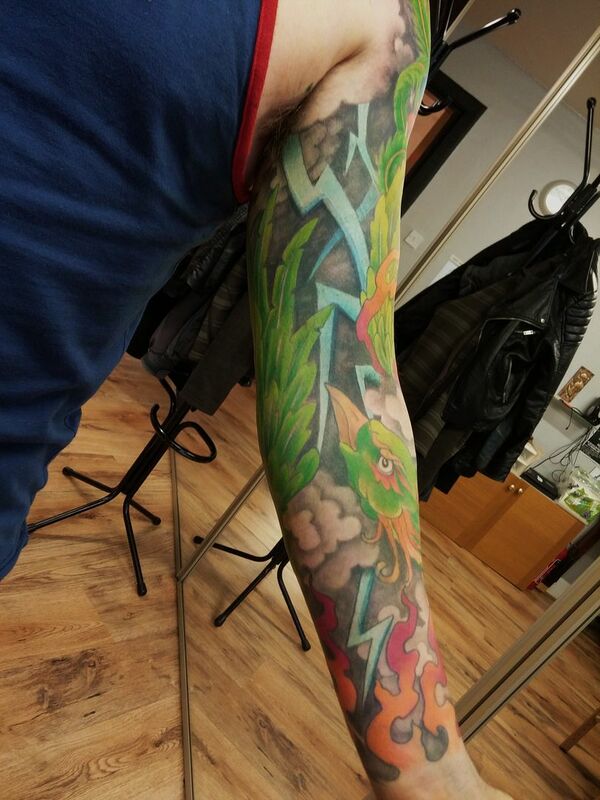 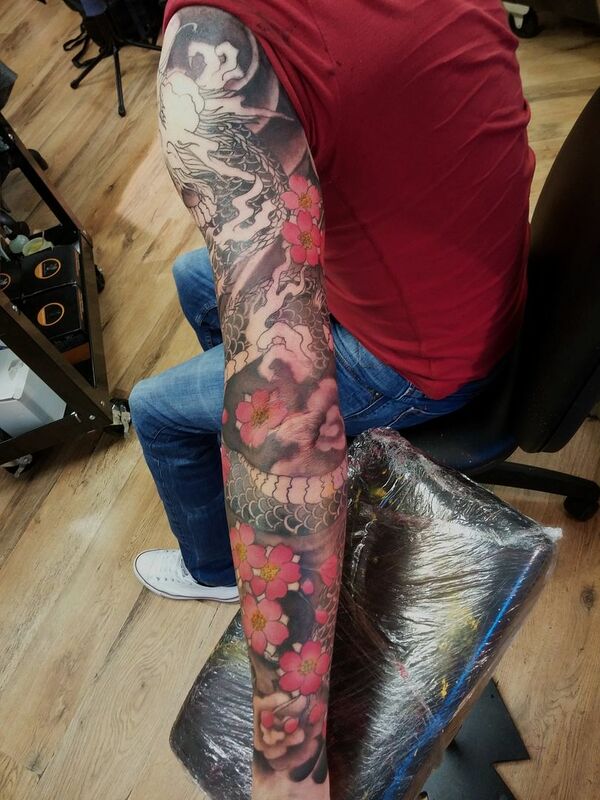 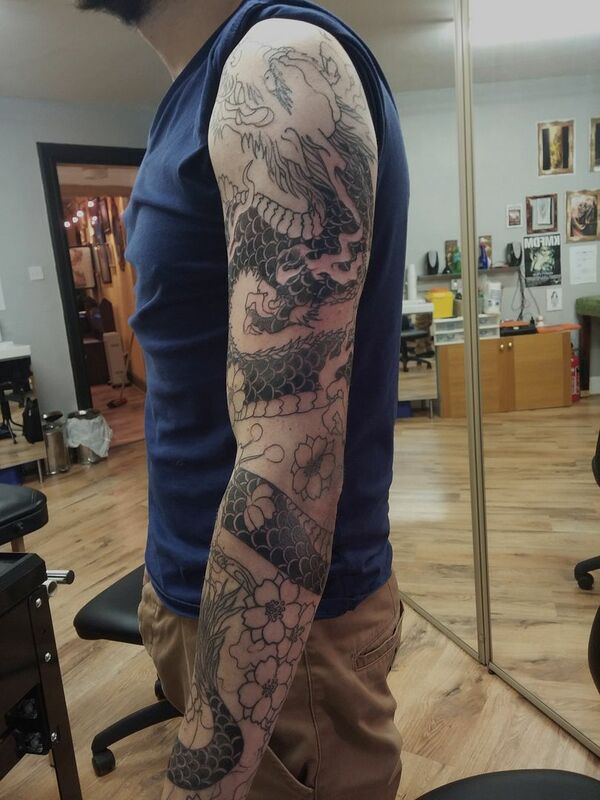 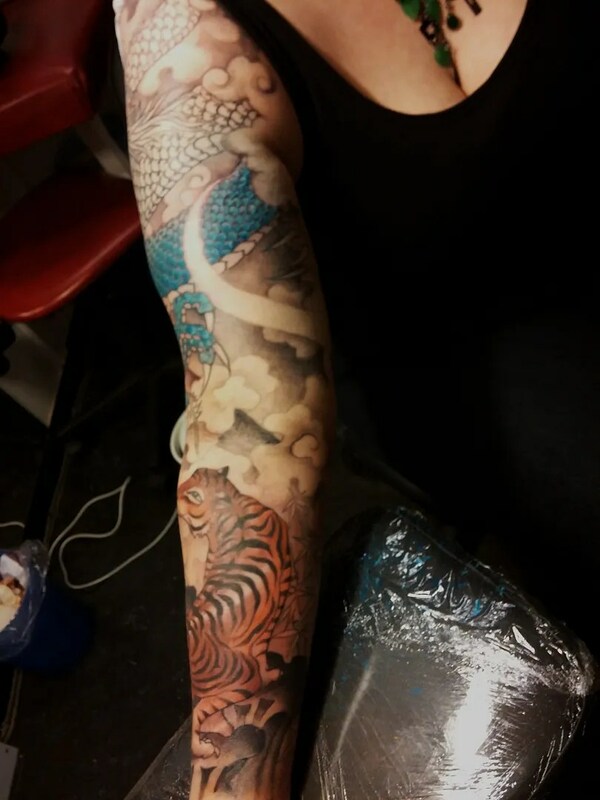 And then for a brand new project, Craig was after a full sleeve with two koi and a dragon koi. A dragon koi is just as the name suggests, a mixture between a koi and a dragon. 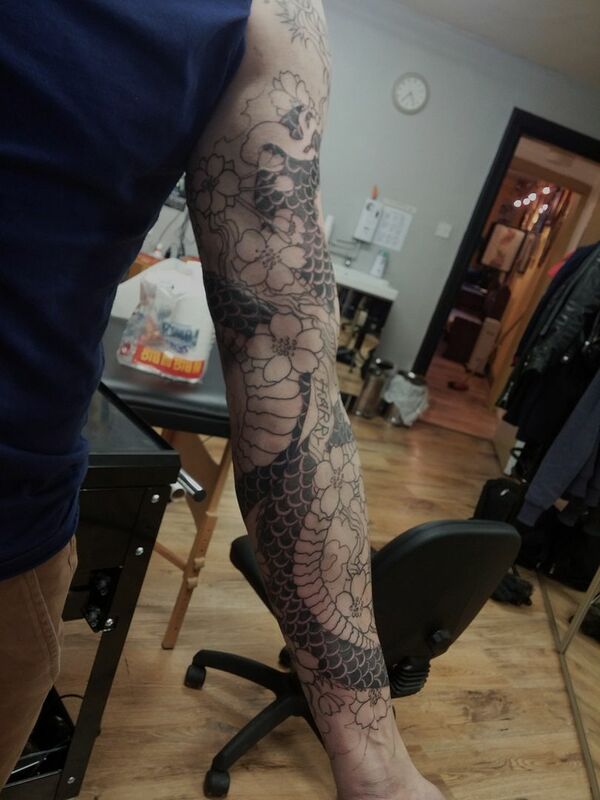 Legend has it that the koi struggles to swim upstream all it’s life and gradually reaches the wisdom it needs to become a dragon. 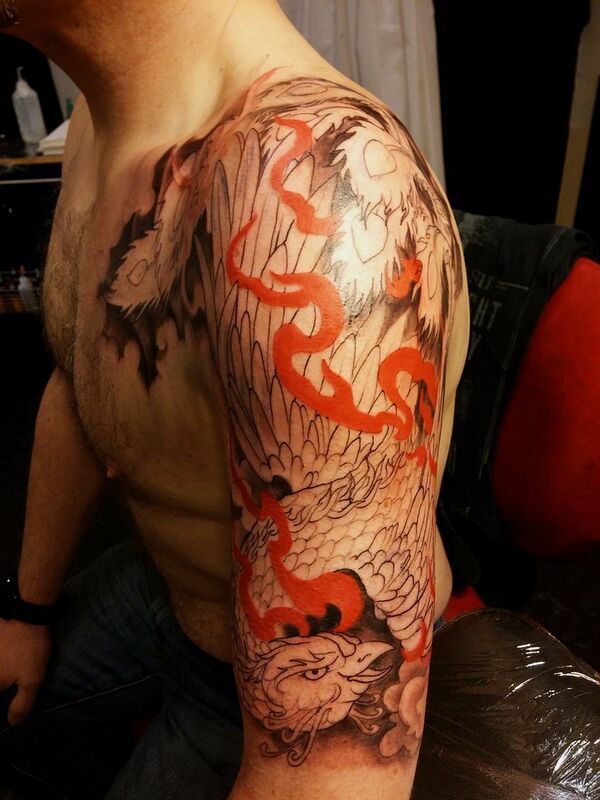 In eastern mythology dragons are wise protectors, unlike ours which tend to be fierce beasties that need slaying. 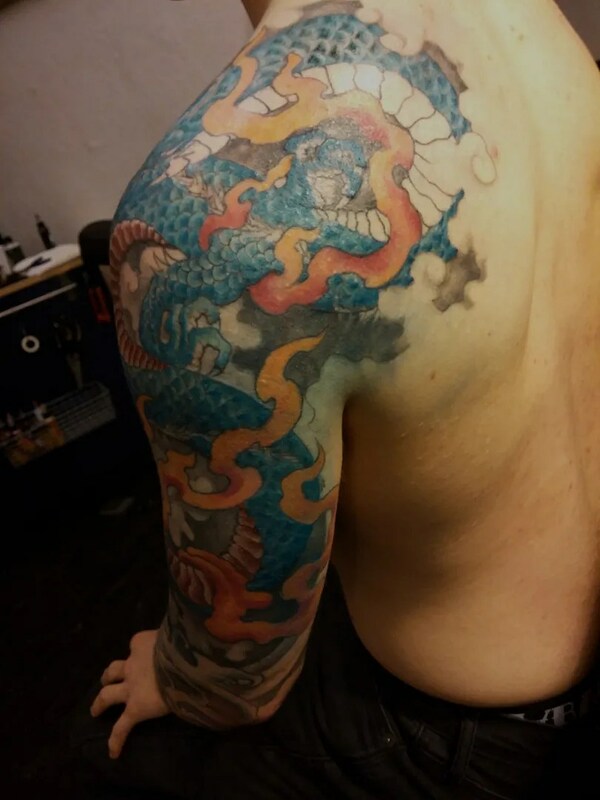 You wouldn’t dare try and slay a japanese dragon! 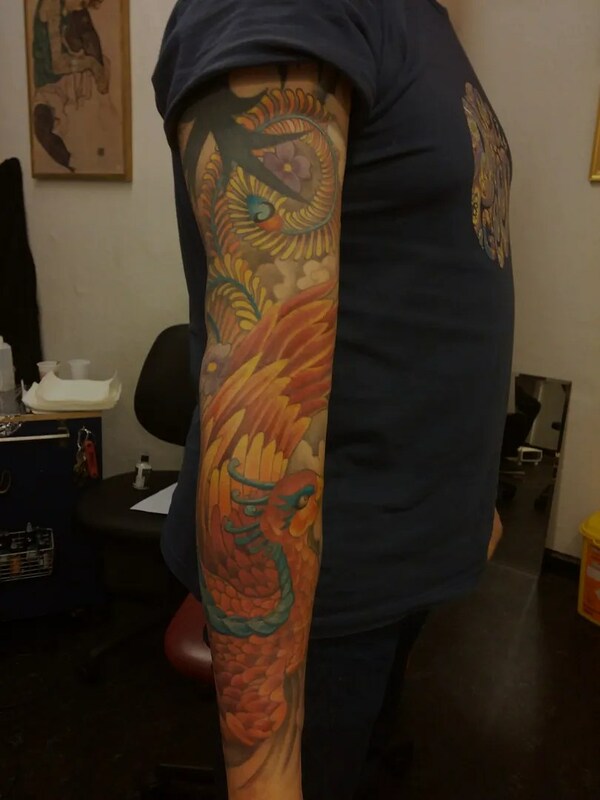 The idea was to have quite a stylised dragon with strong wind bar type structures and water, kind of chunky and colourful. 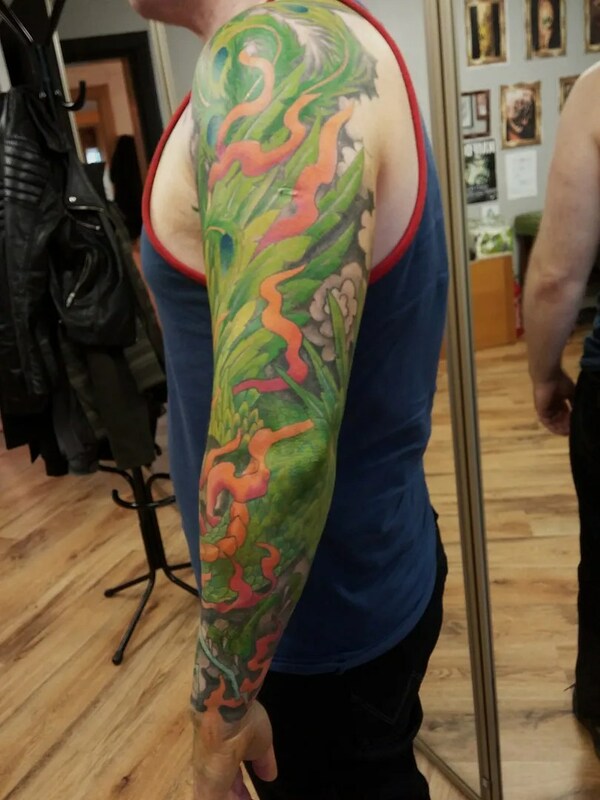 Looks just like that to me, and I love the picture of Joe wearing the piece! 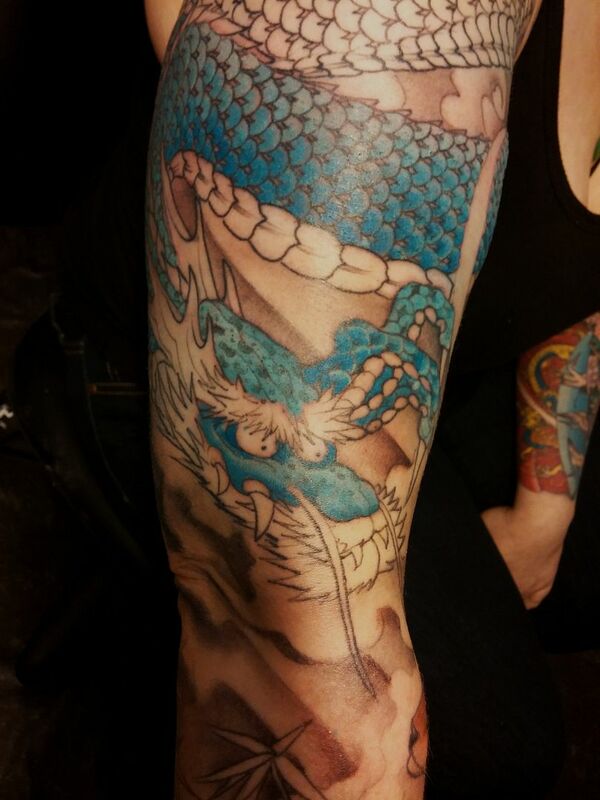 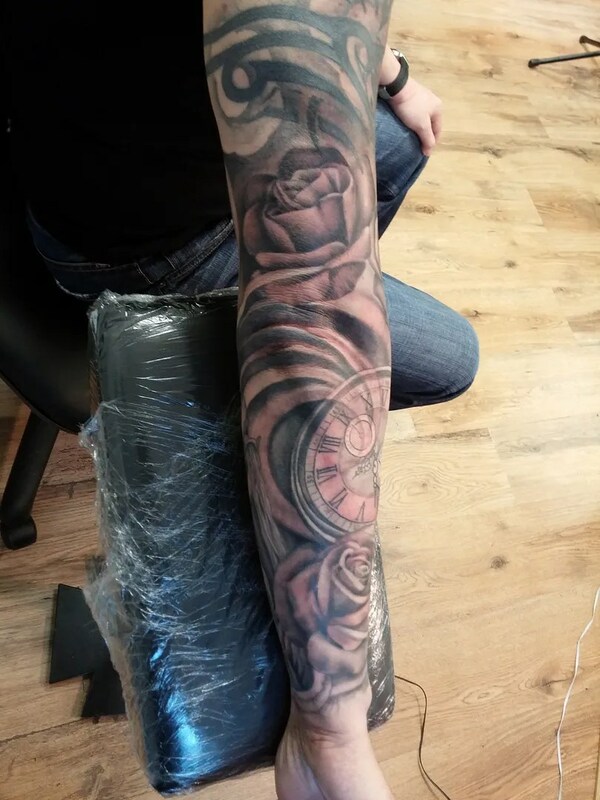 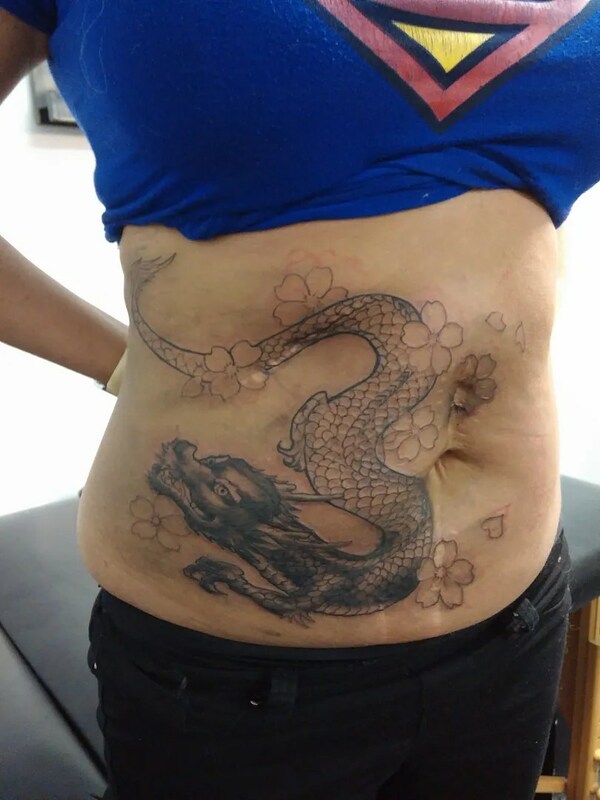 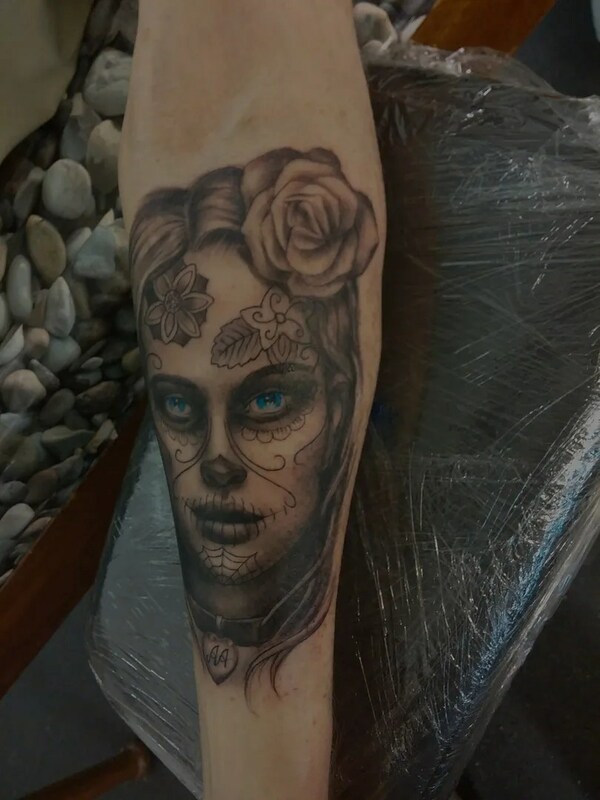 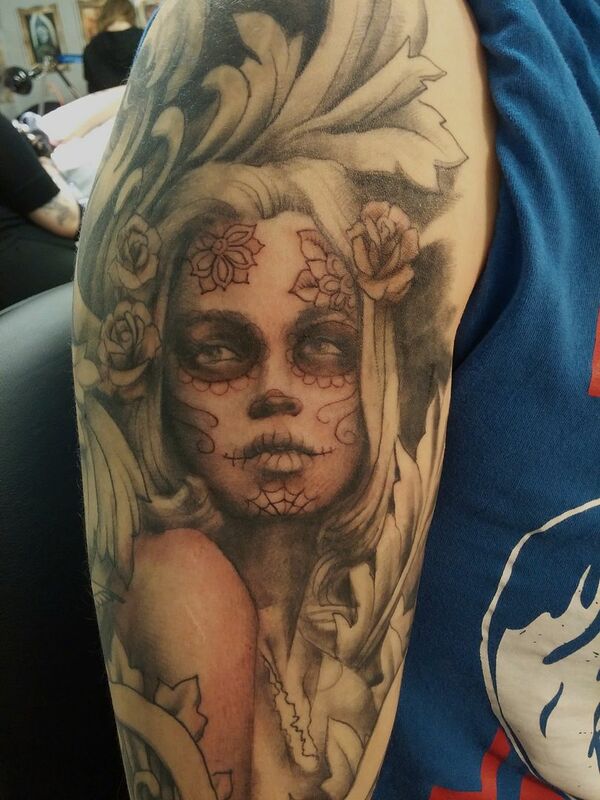 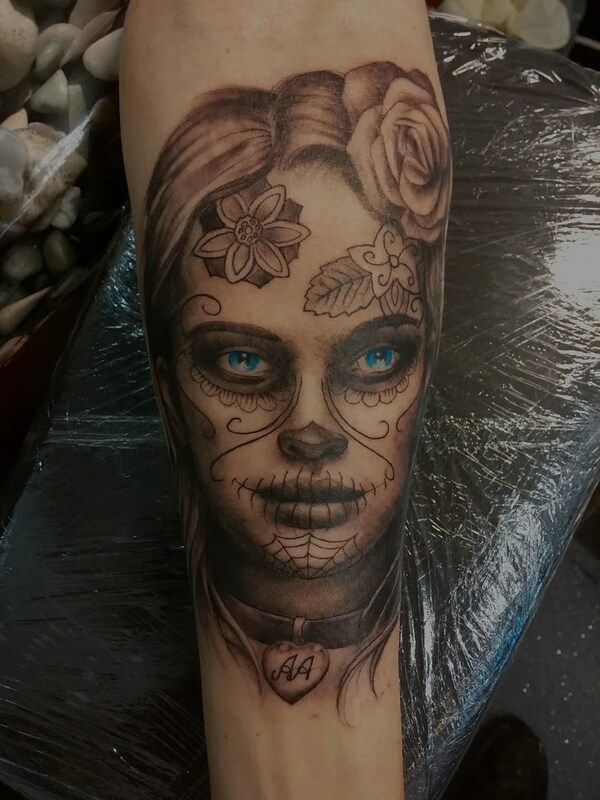 Aileen is working on her second sleeve, today we started filling in some of the blue scales, and coloured the tiger. 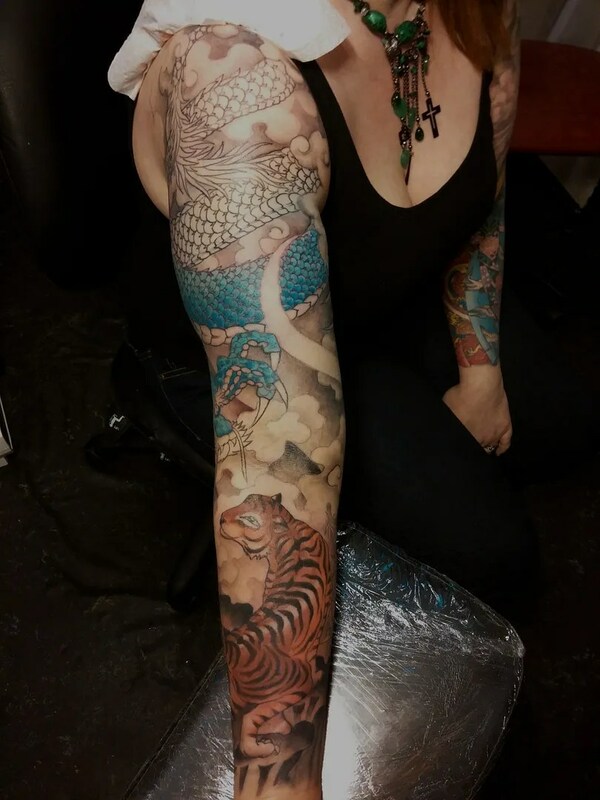 I love both the tiger and the dragon’s faces, they were not meant to be fierce, and i have to smile every time I look at them! 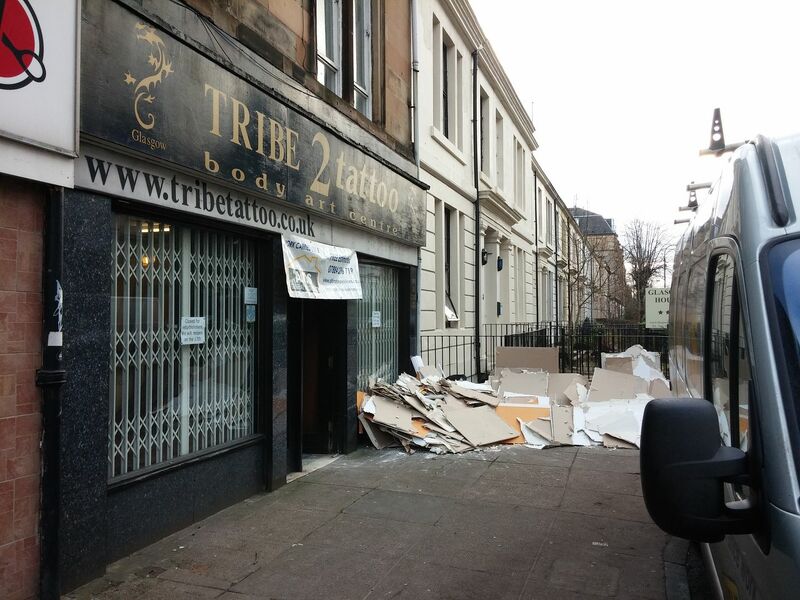 I was off on Wednesday, as our Glasgow studio is closed for the week. 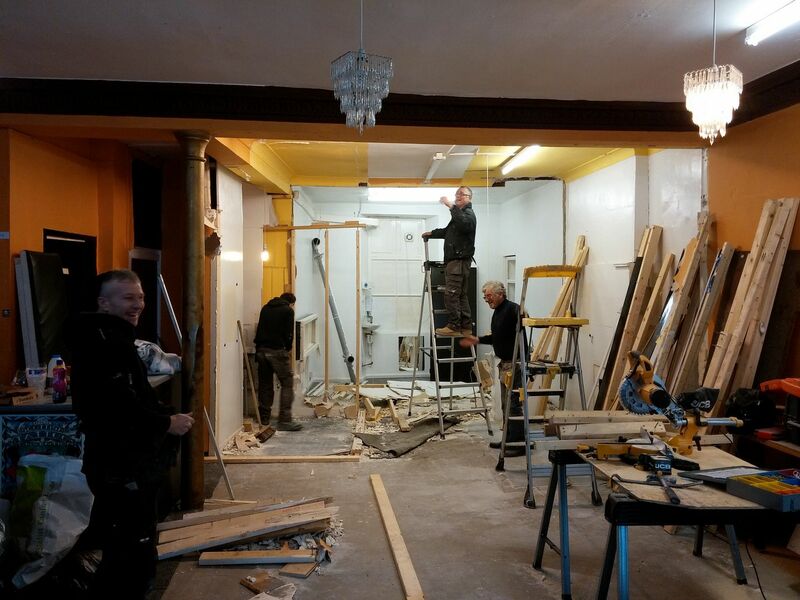 We are having a refit, and next time you visit, you’ll see that the waiting room is half the size! 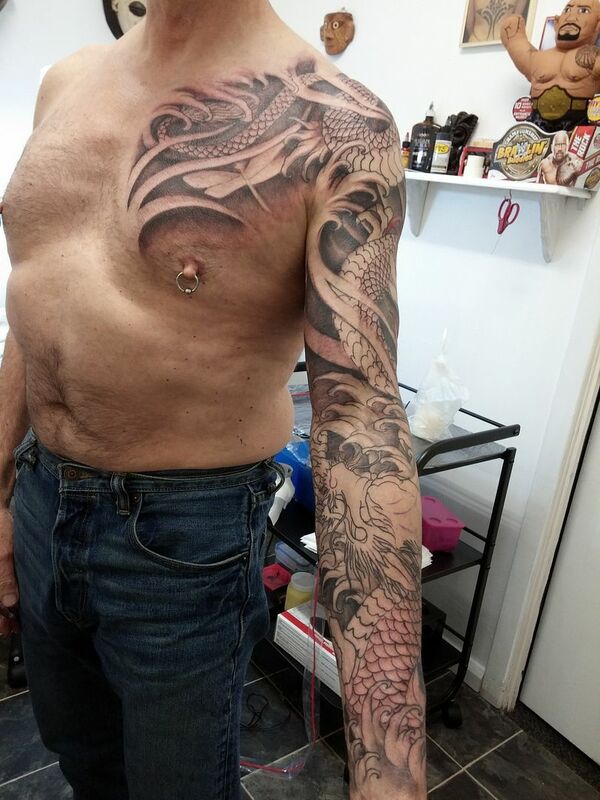 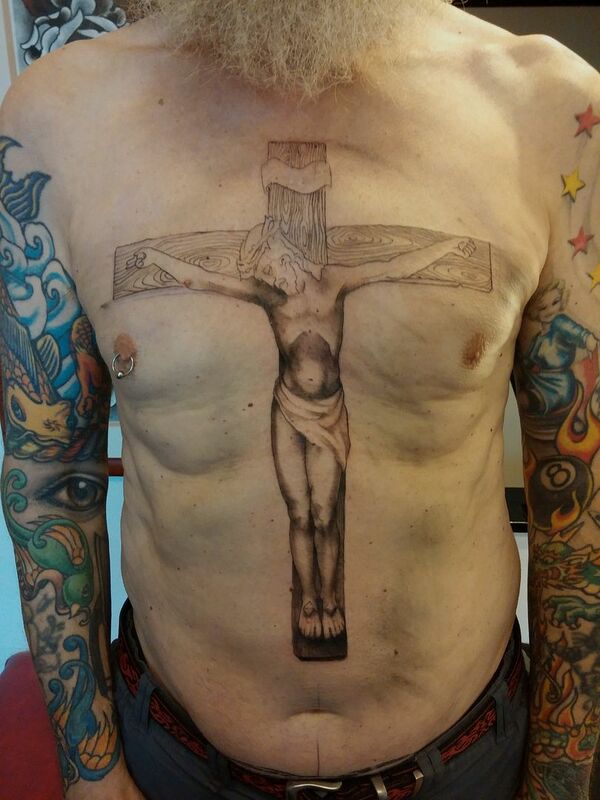 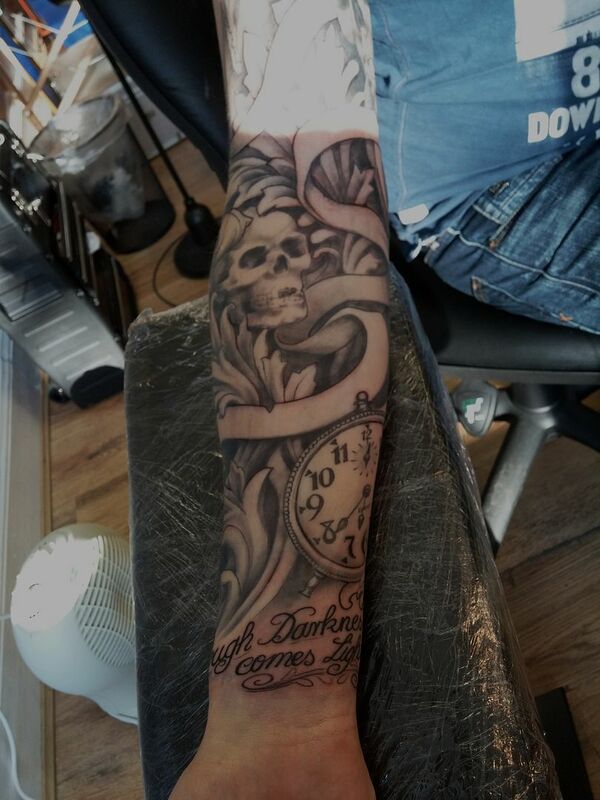 The good news is that all the tattooists will be working upstairs now, (making use of the natural light) and the piercing and lasering will move downstairs. our Olivia was well overdue a bat tattoo, and today was the day. 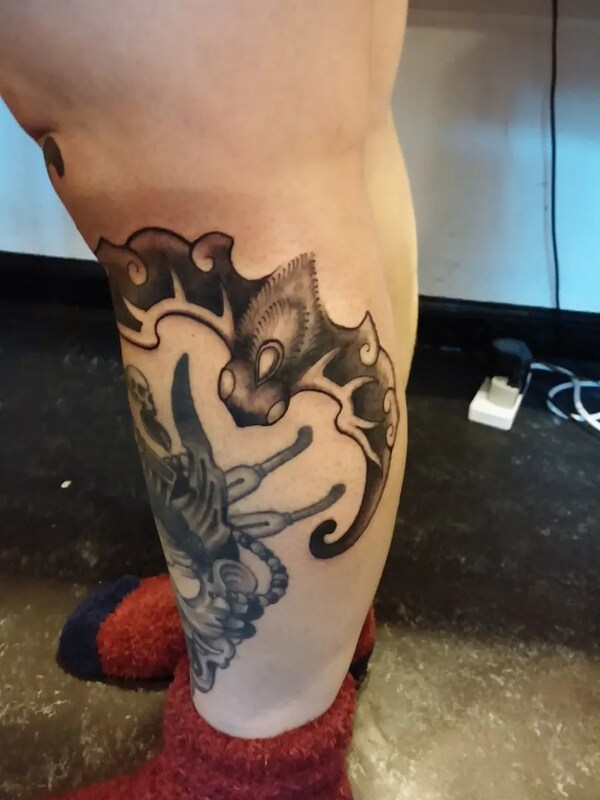 It’s a chinese good luck bat, and now that she has one on her leg she should be sorted for life! 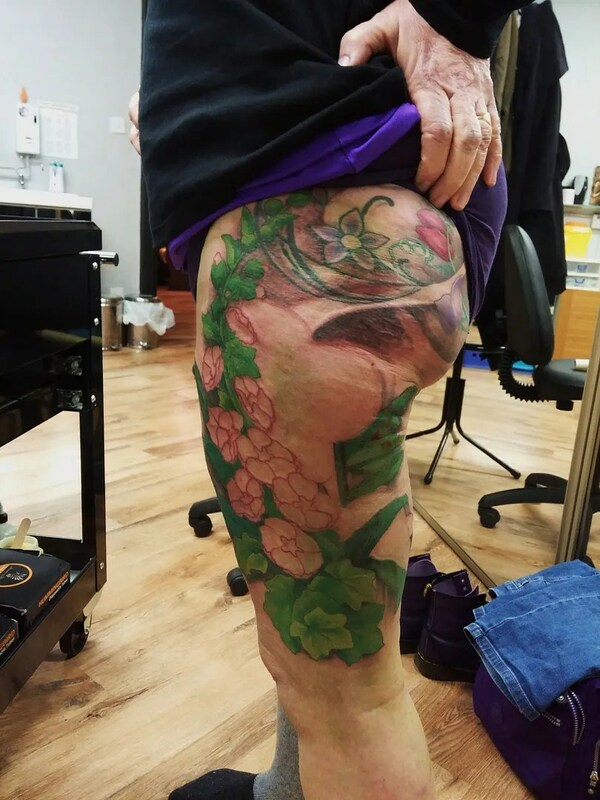 ‘Lucky Liv’ the famous tattoo lady- maybe her legendary luck will travel through her tattoo machine into her customers, and they, too, will be very lucky! 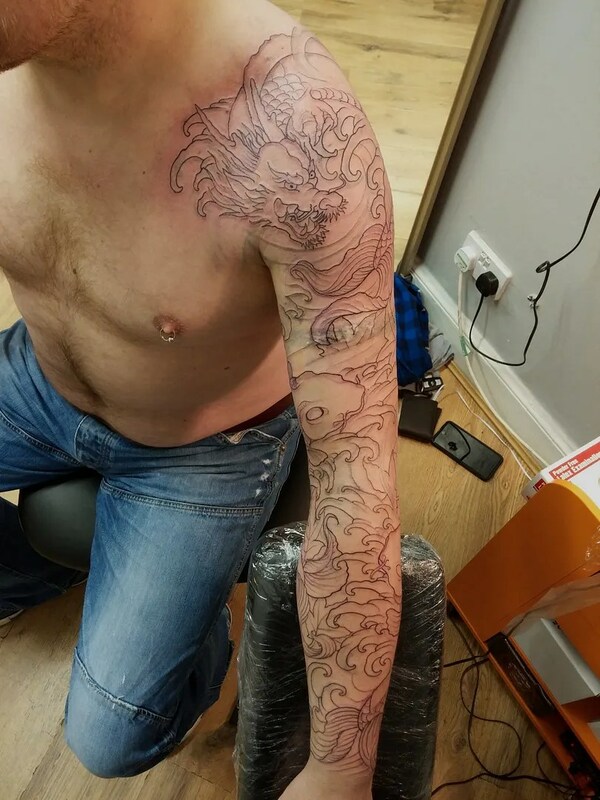 Worth a try, wouldn’t you agree? 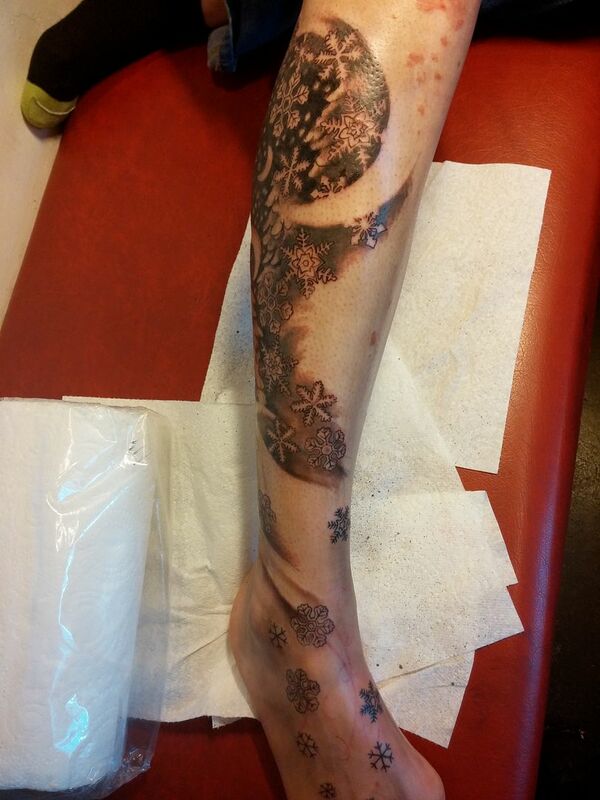 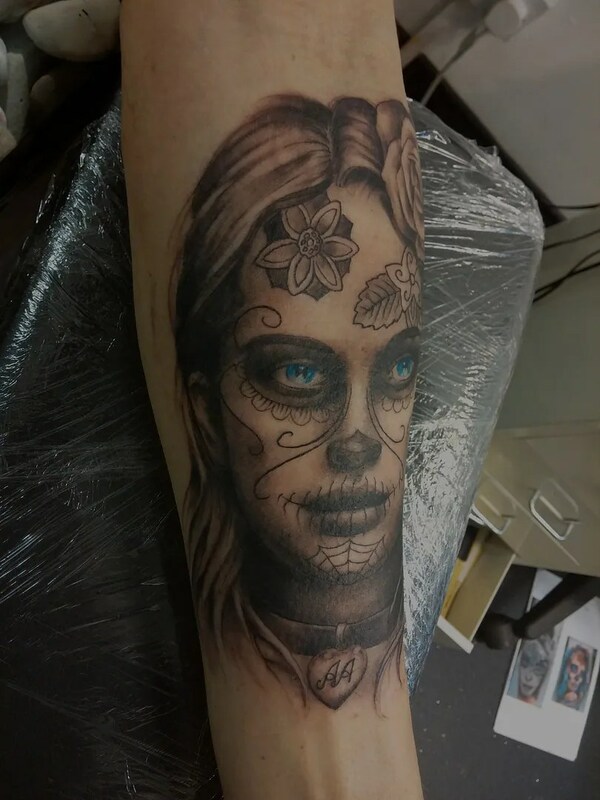 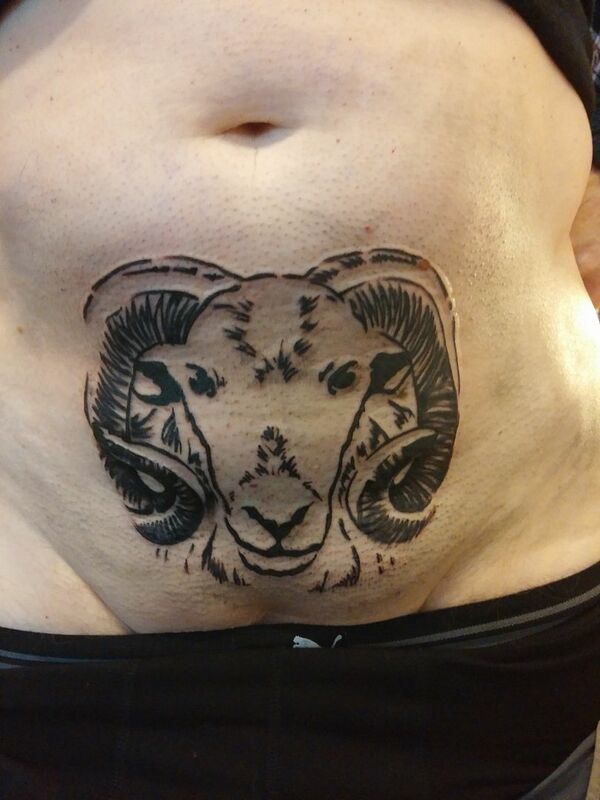 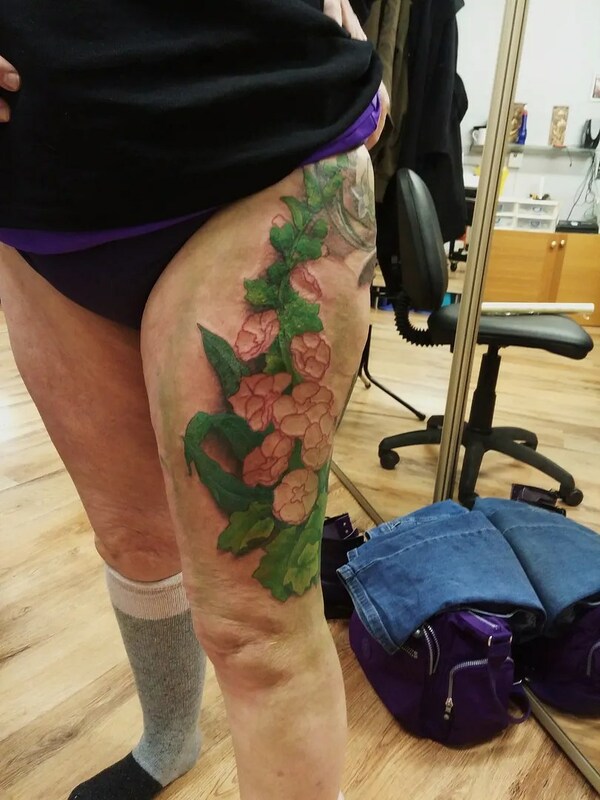 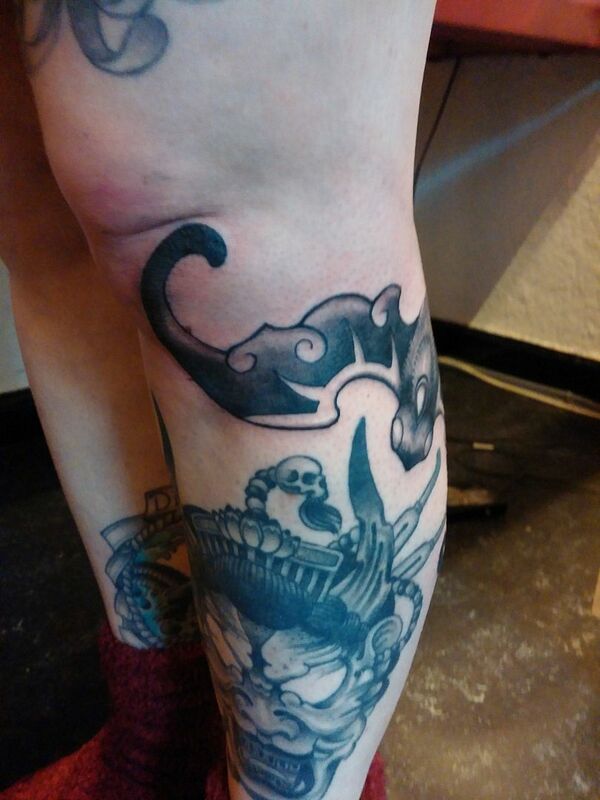 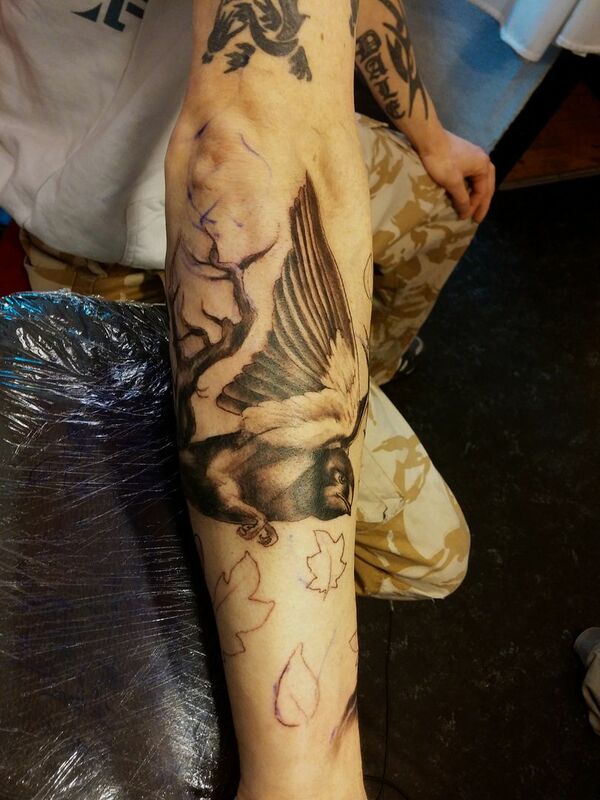 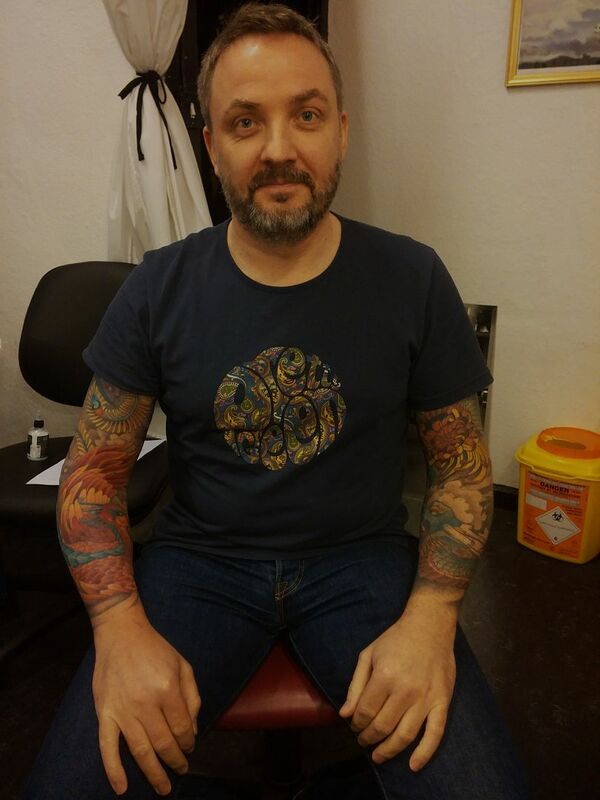 The knee is not the easiest place to get tattooed, and I was trying to be extra gentle, yet swift. 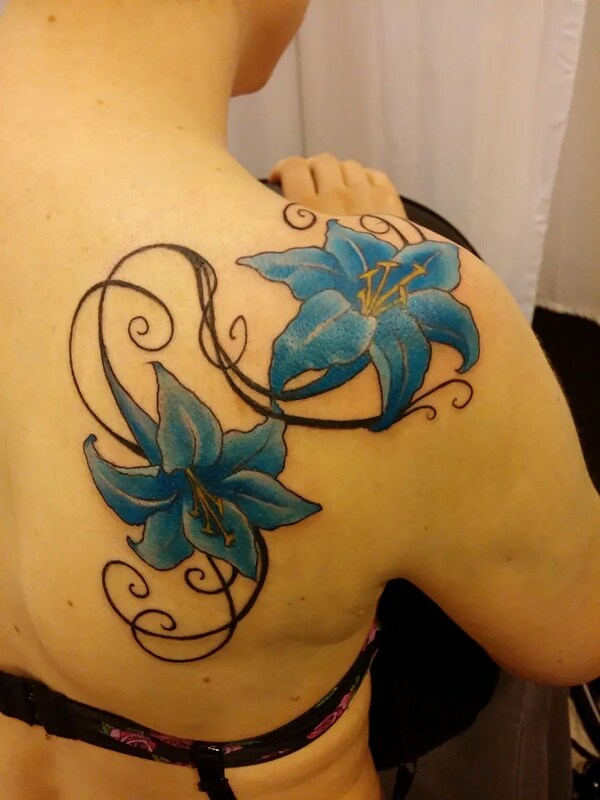 Because i love her, of course, and also because she was tattooing me two days later. 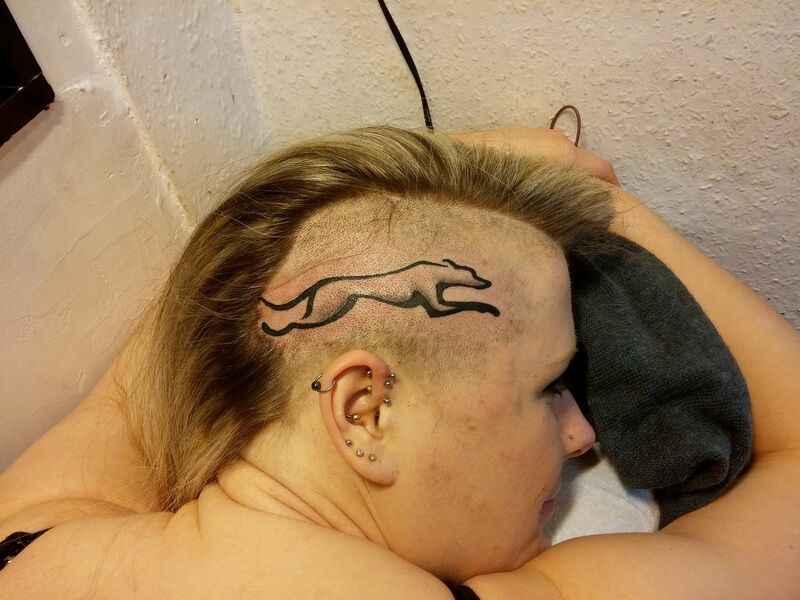 I didn’t want to arouse any feelings of revenge in her. 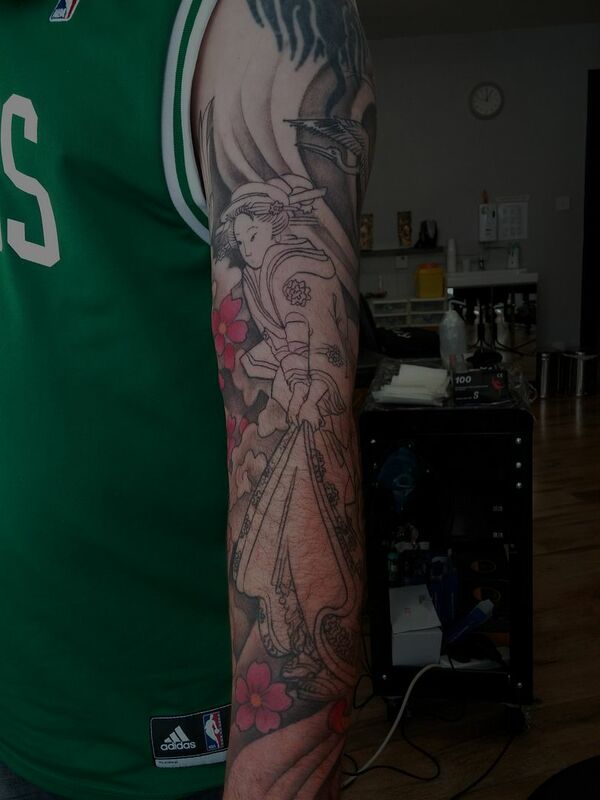 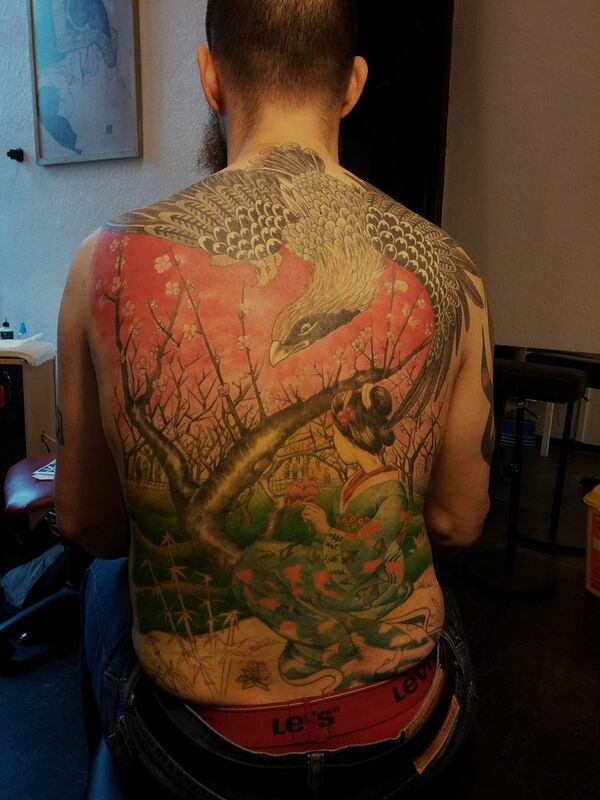 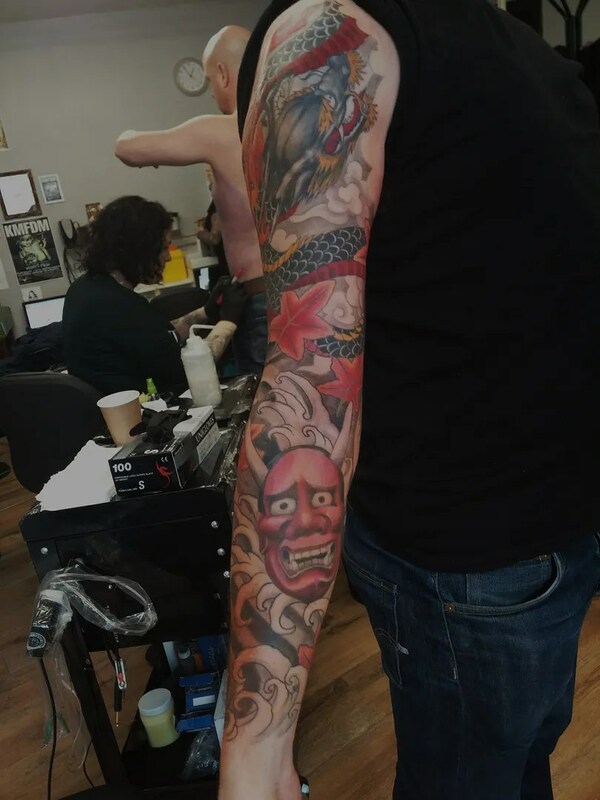 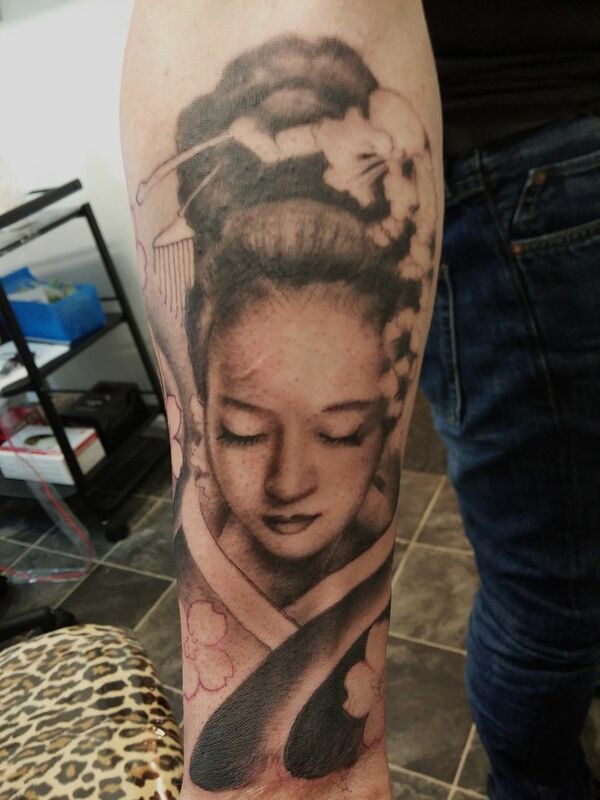 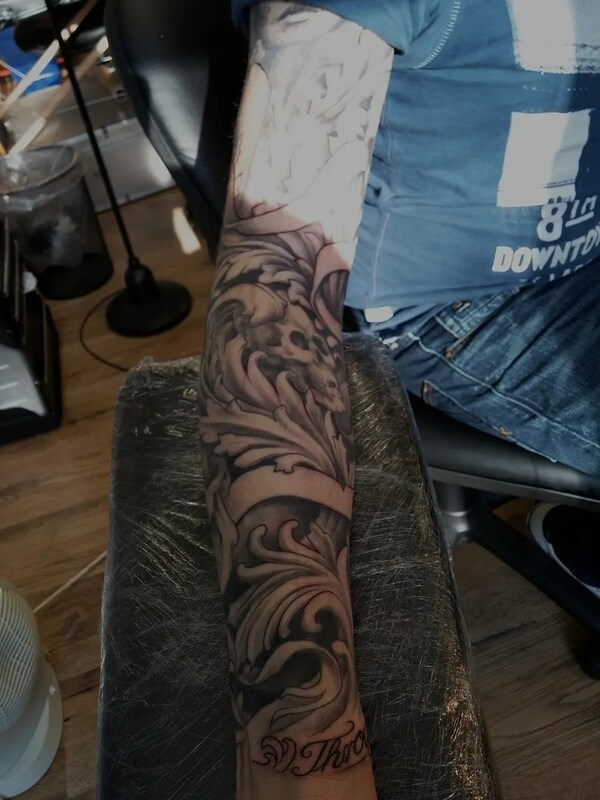 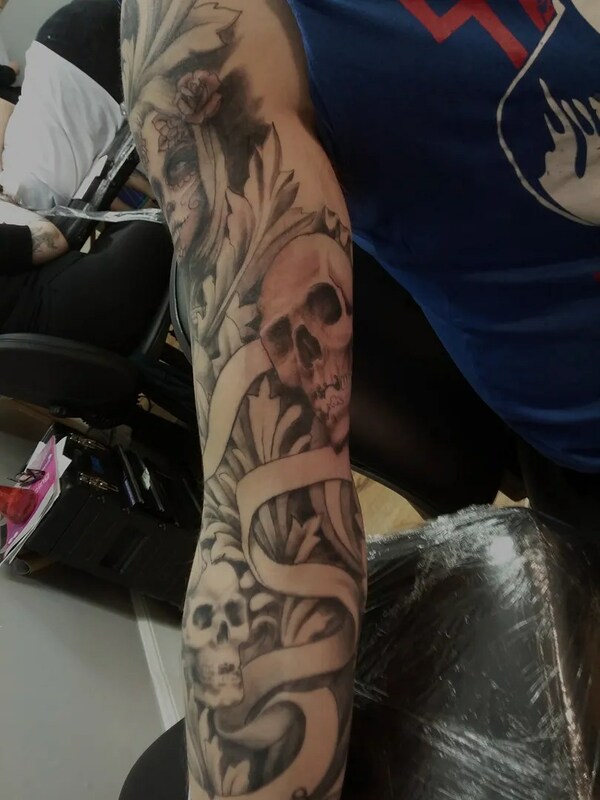 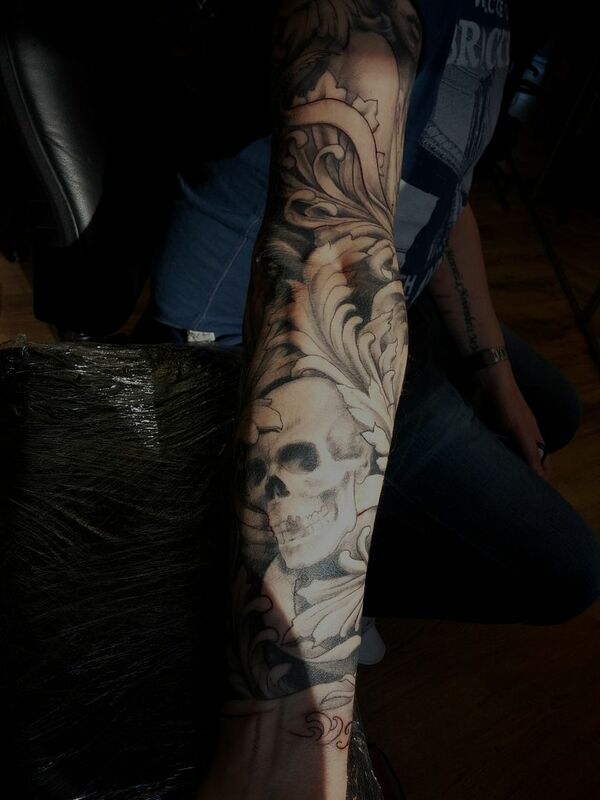 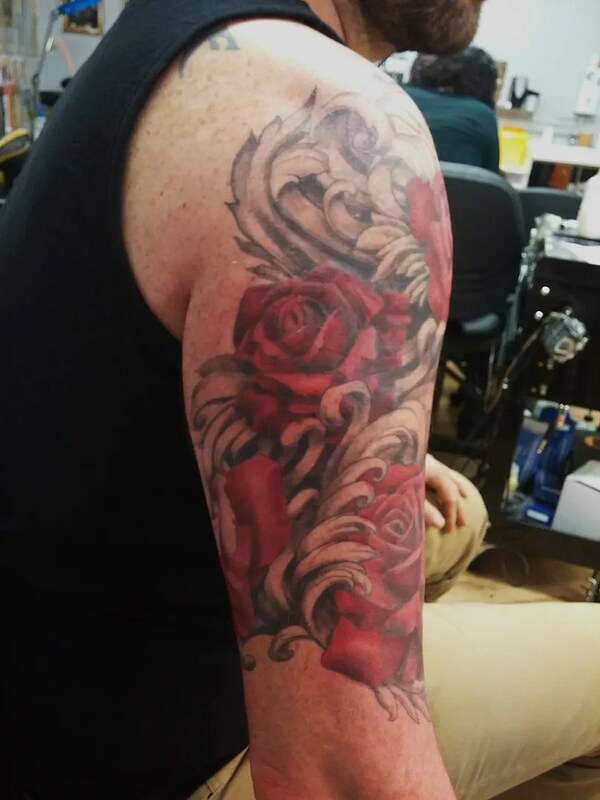 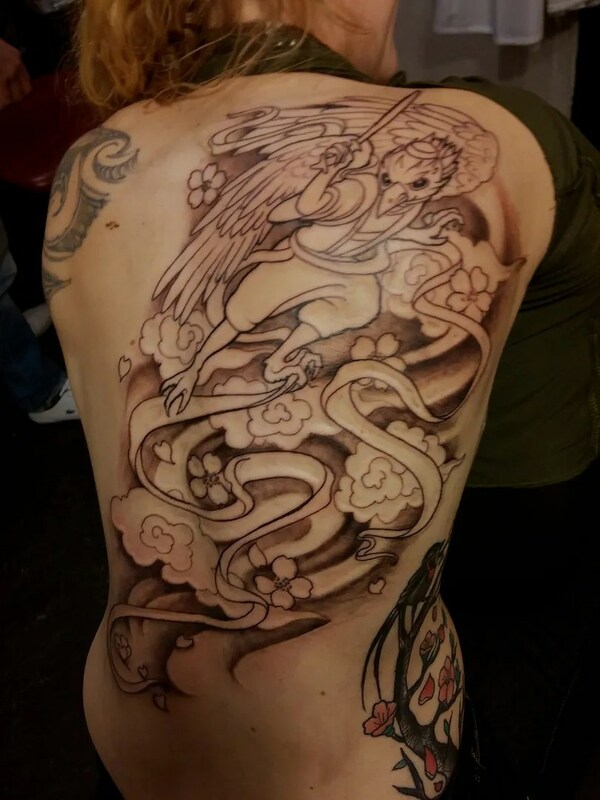 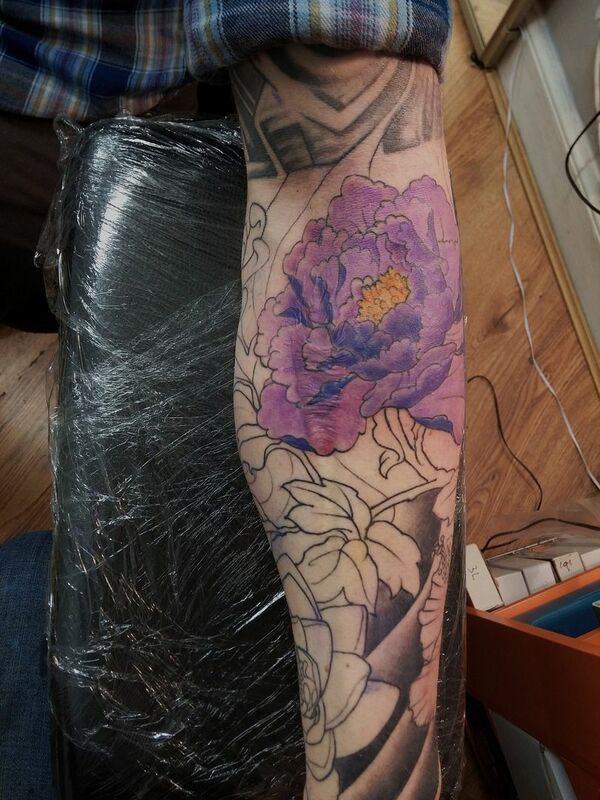 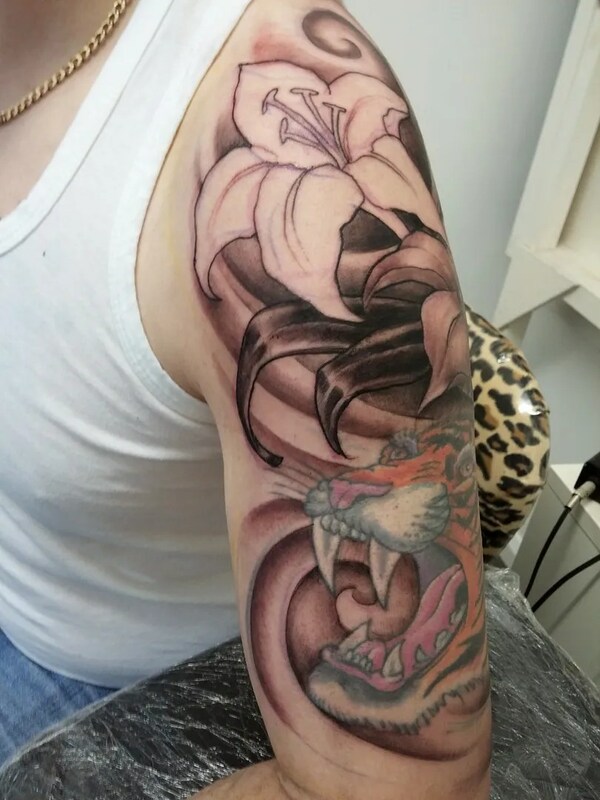 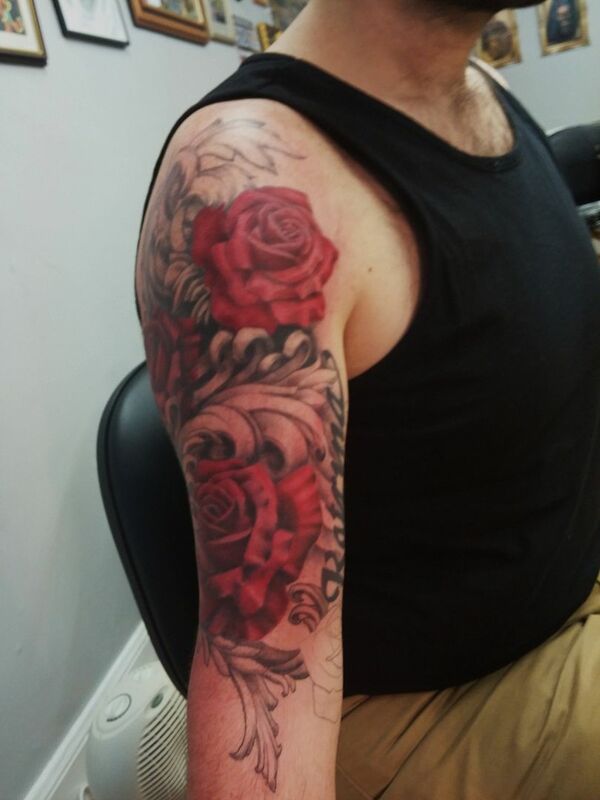 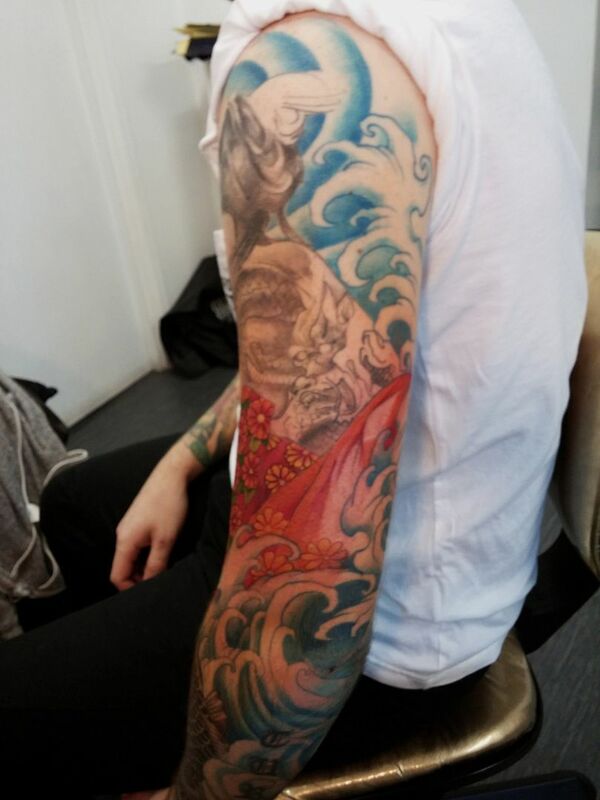 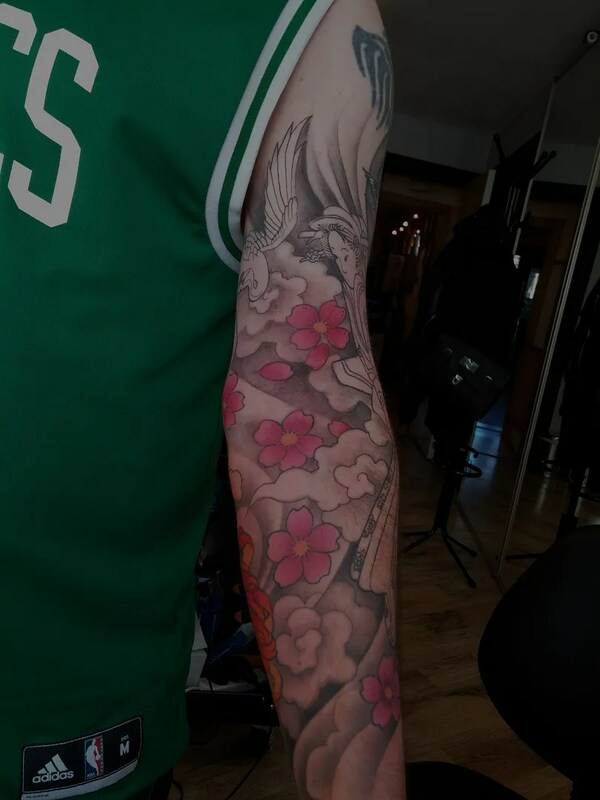 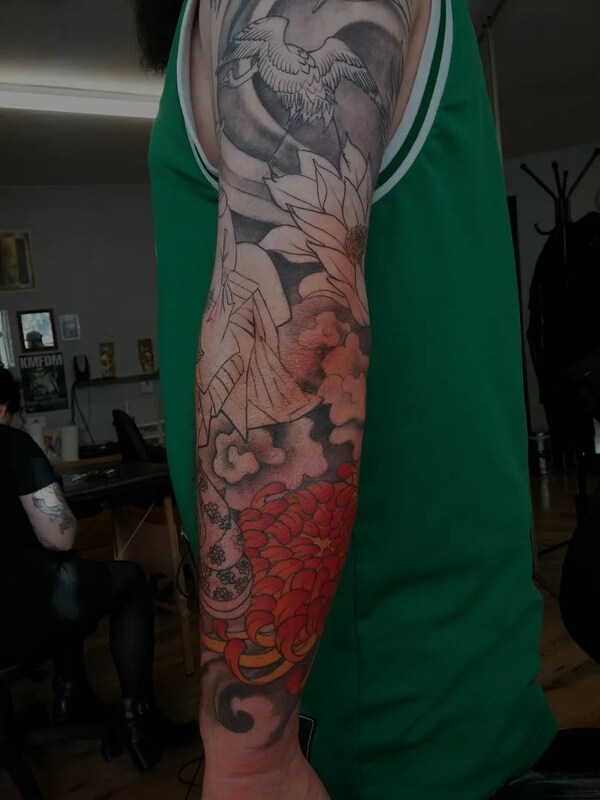 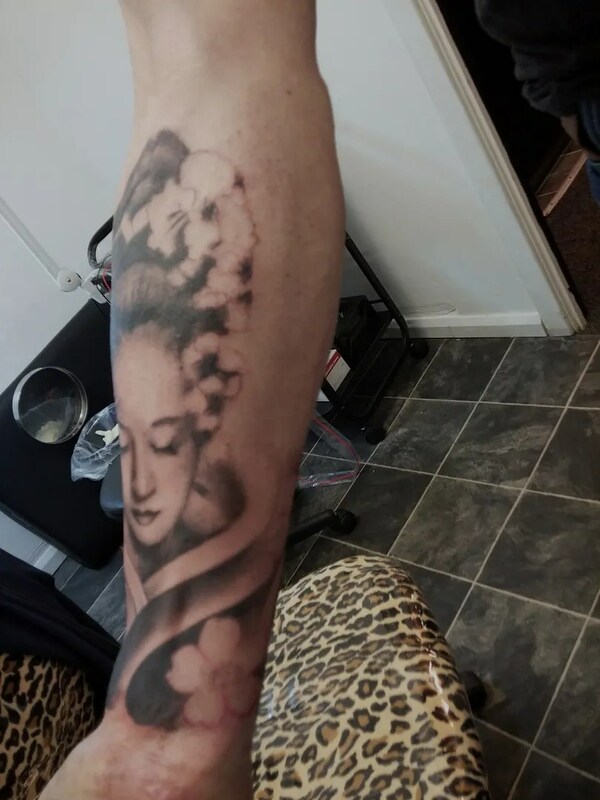 so here is the late blog..
Alex is getting a sleeve, with a tengu, a geisha and some flowers, there will also be a waterfall in the background. 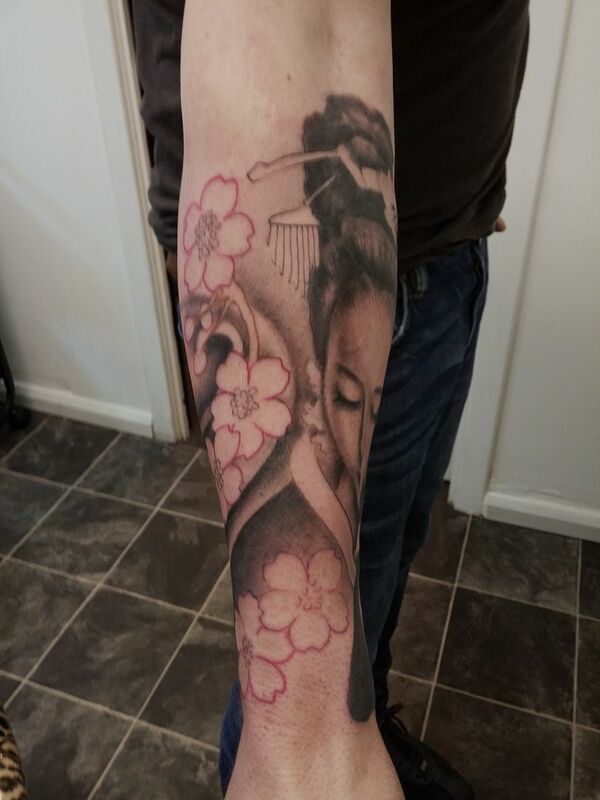 today we started at the bottom, with the geisha and some flowers.